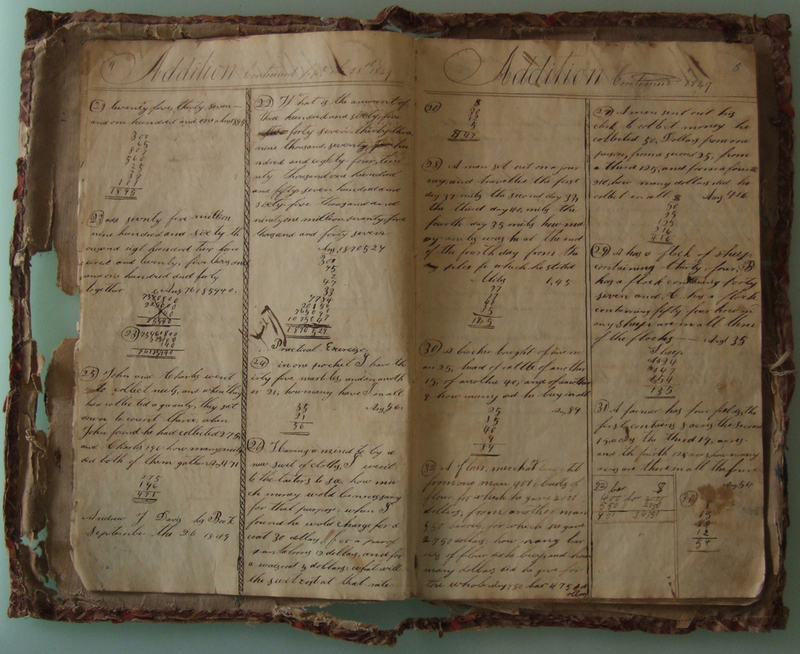 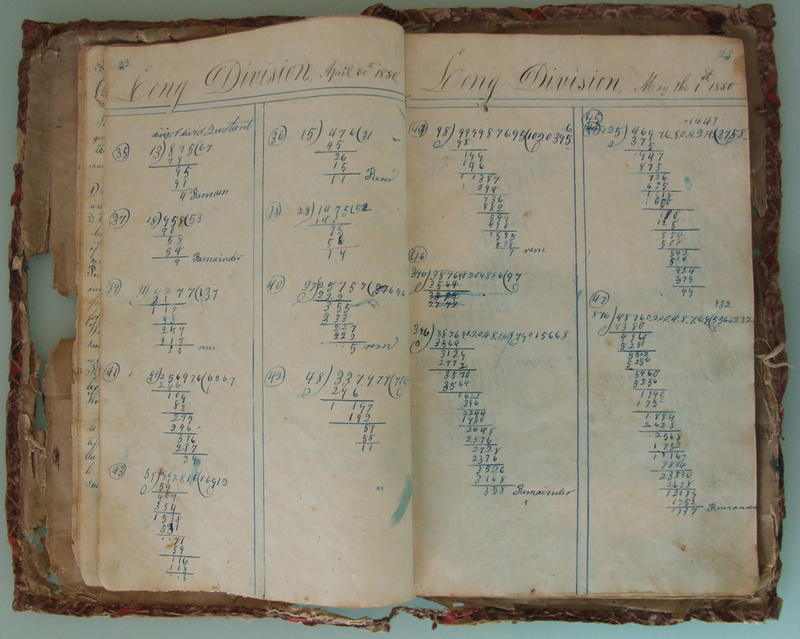 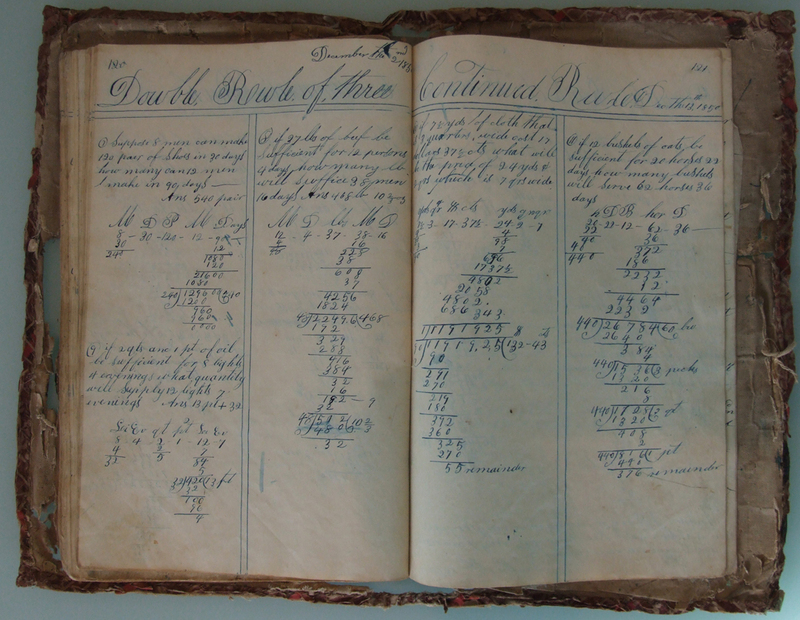 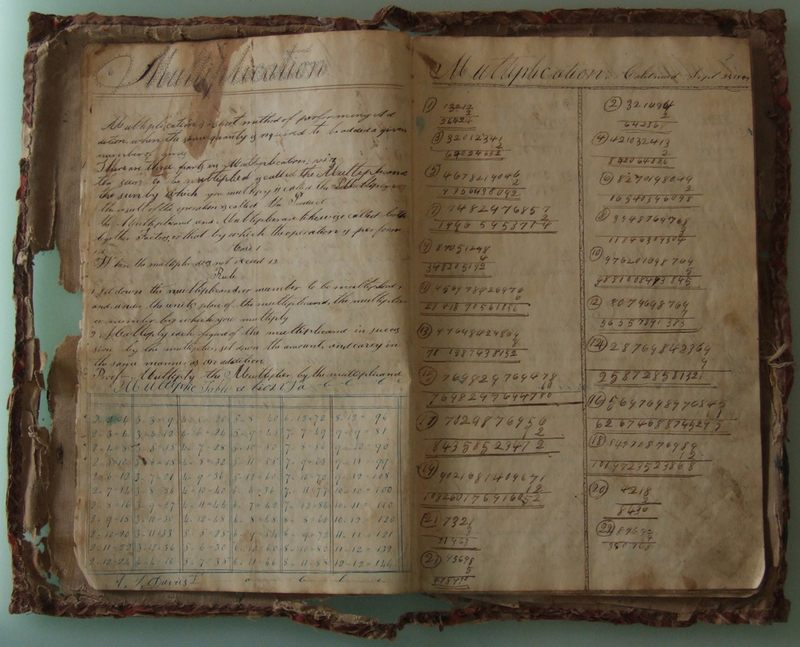 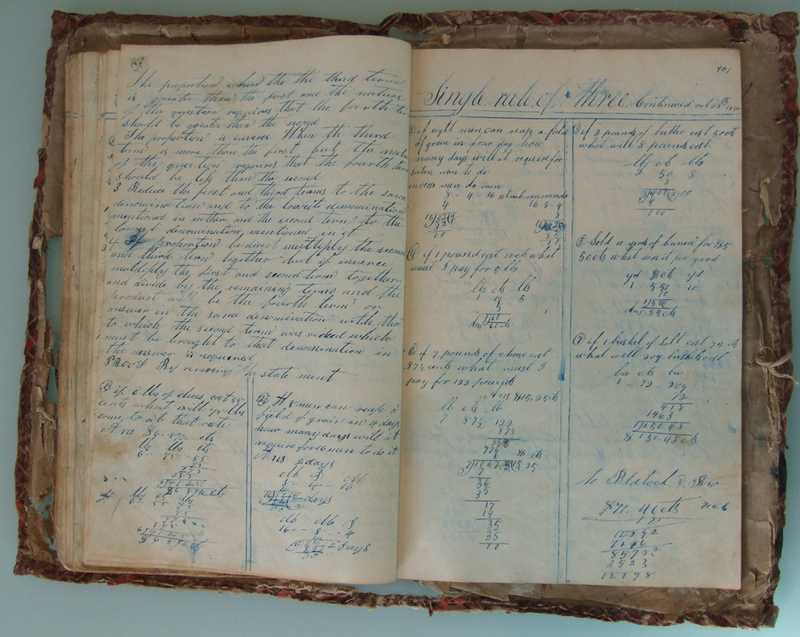 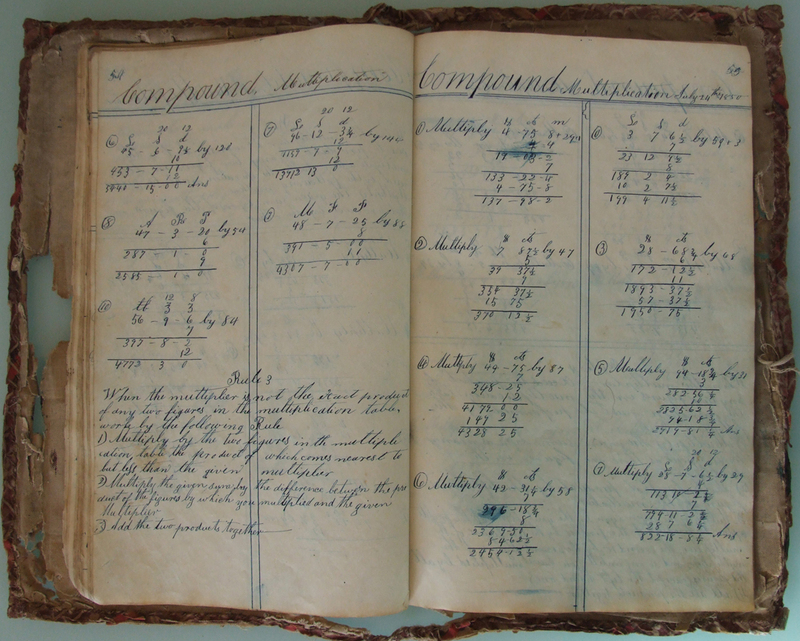 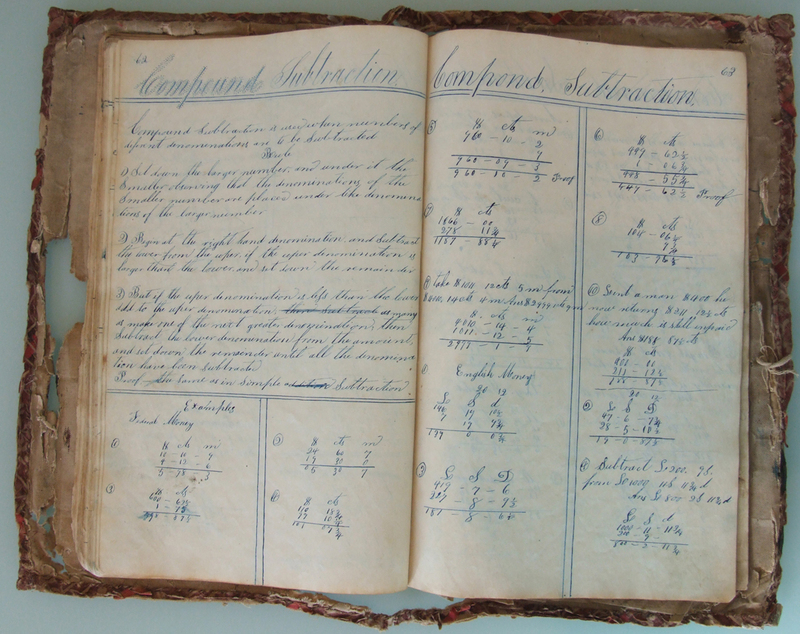 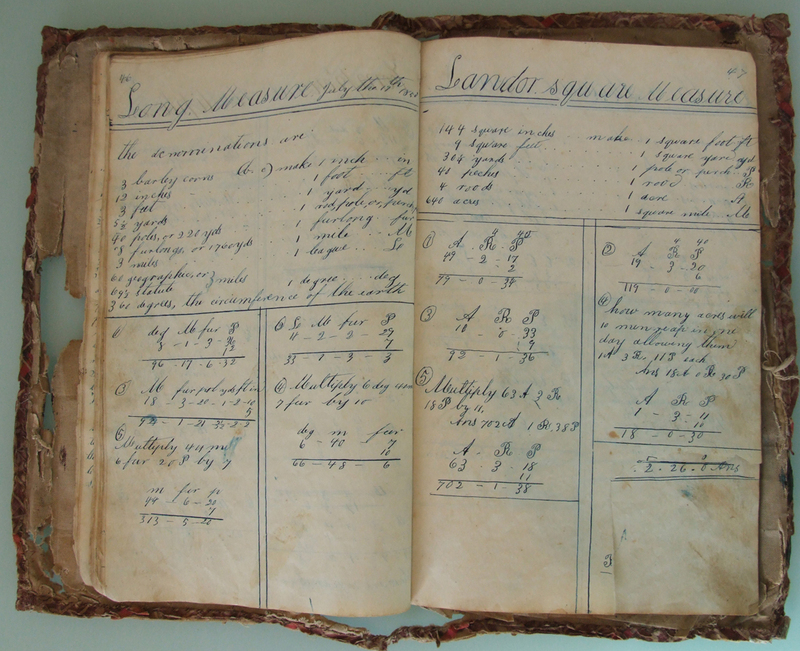 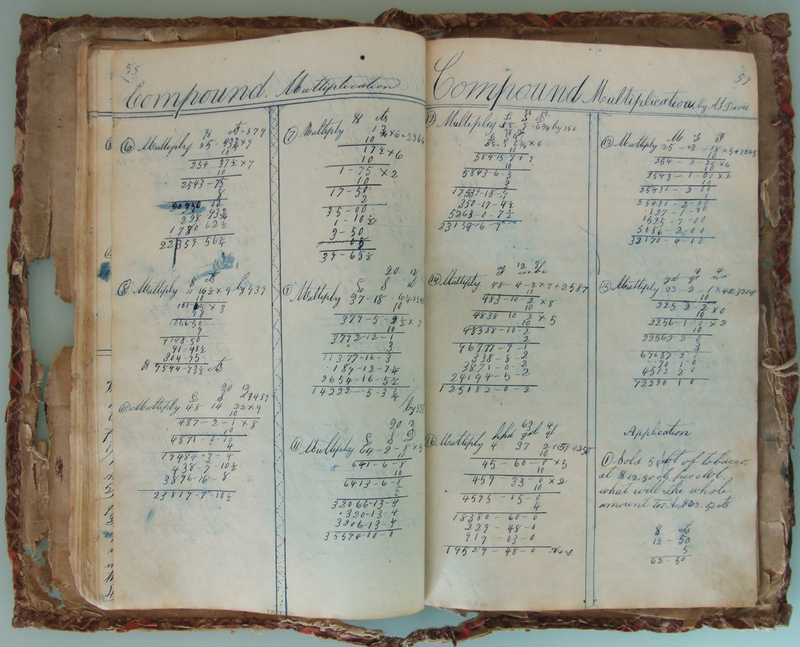 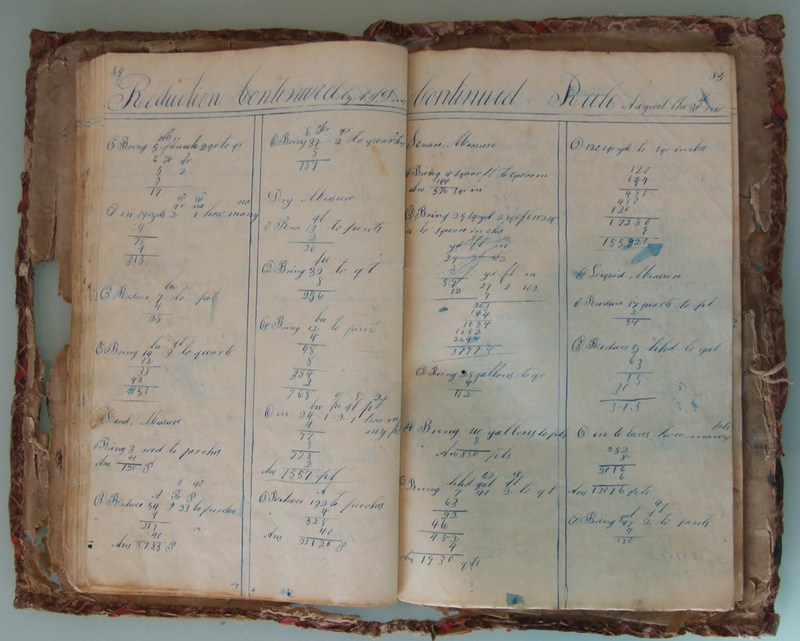 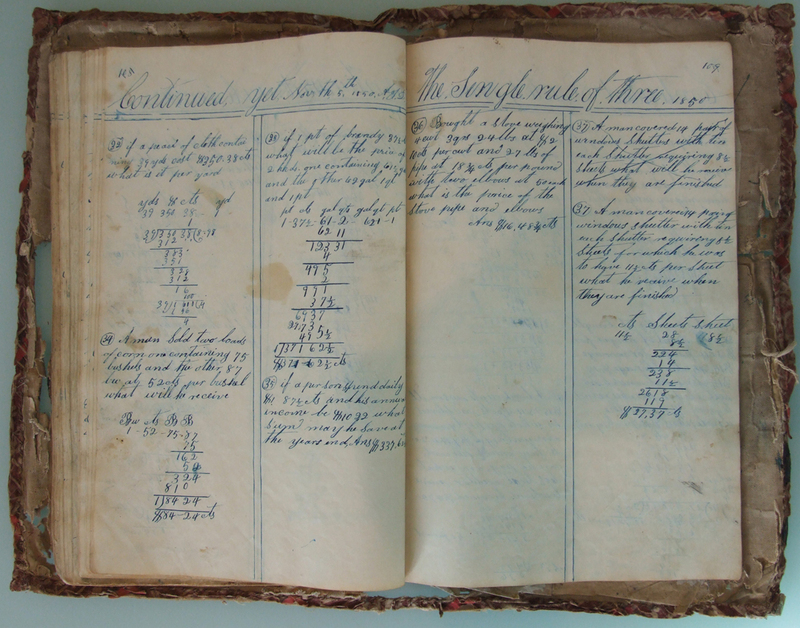 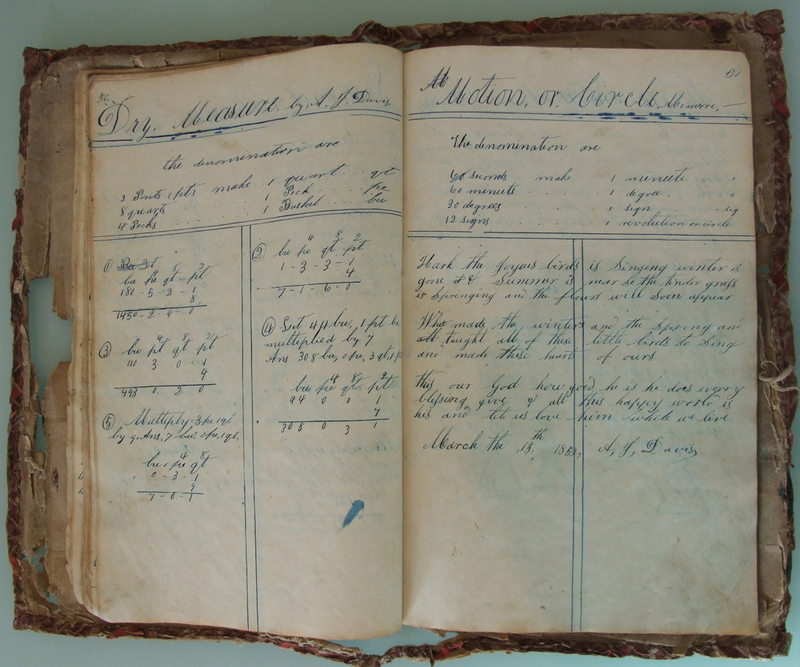 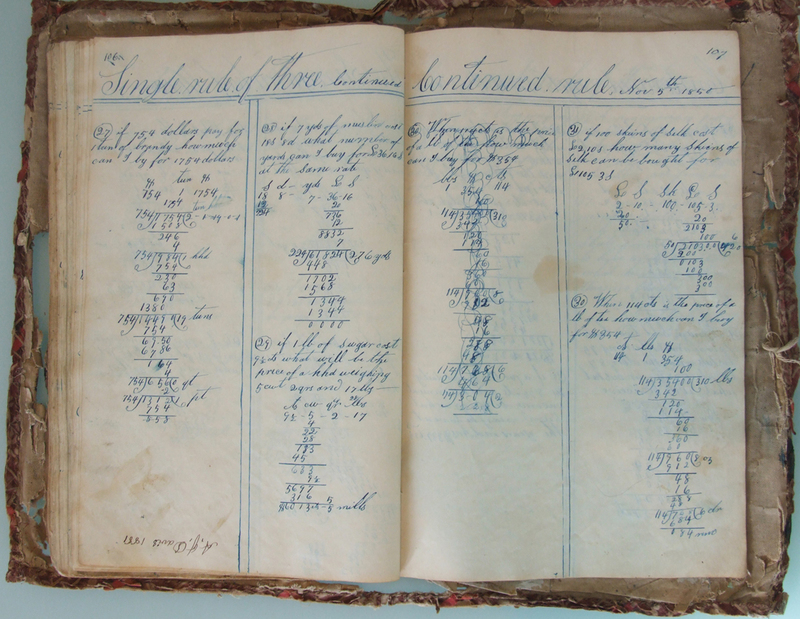 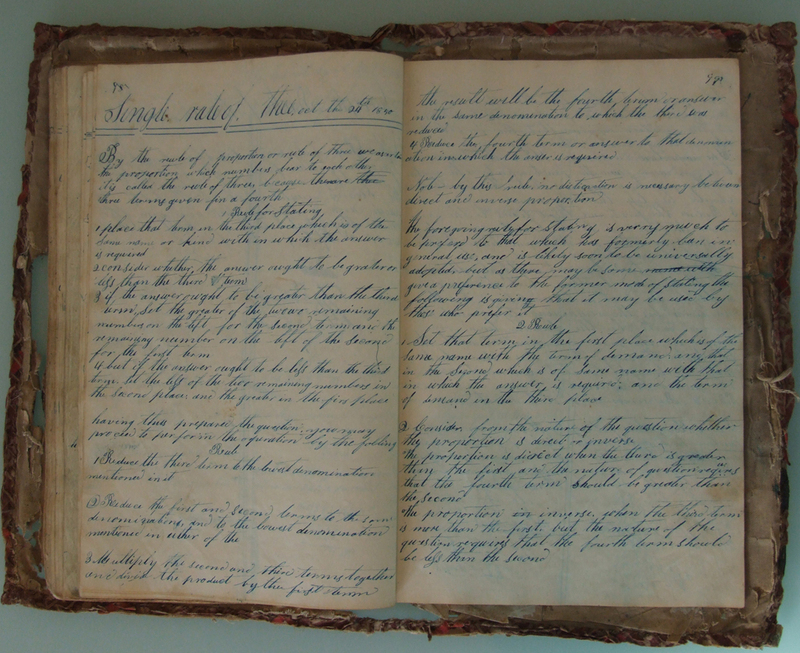 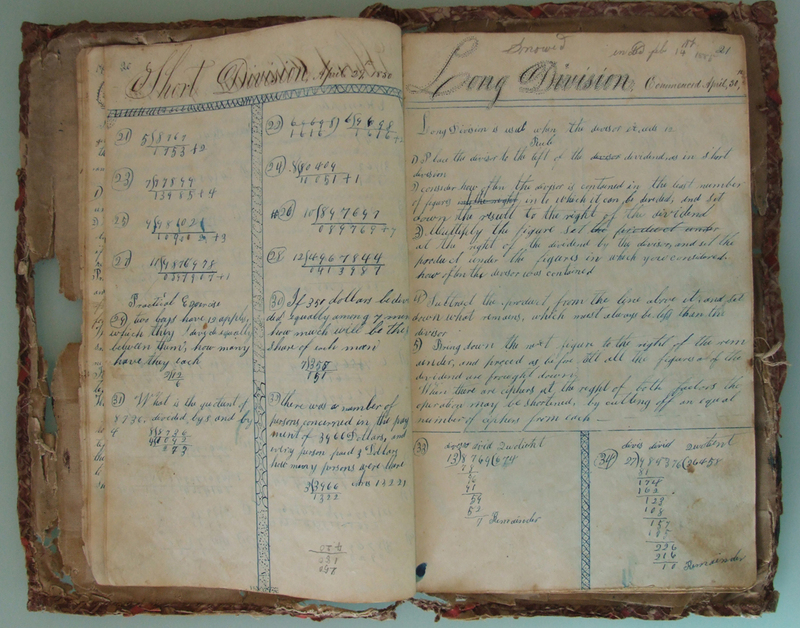 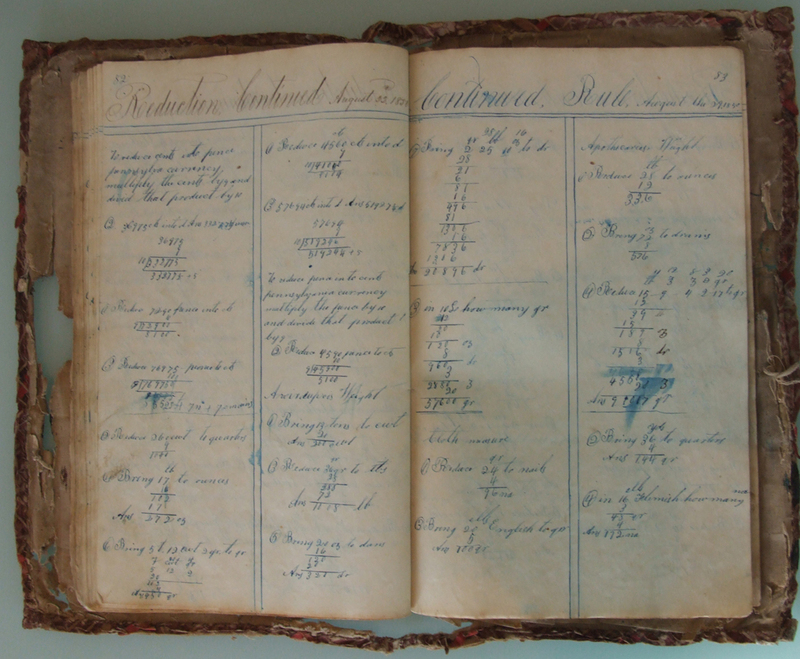 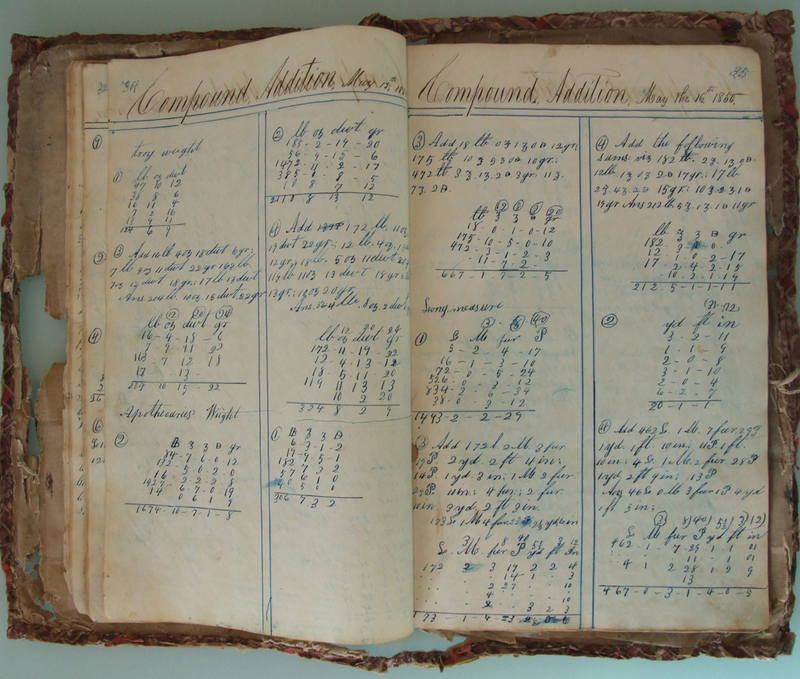 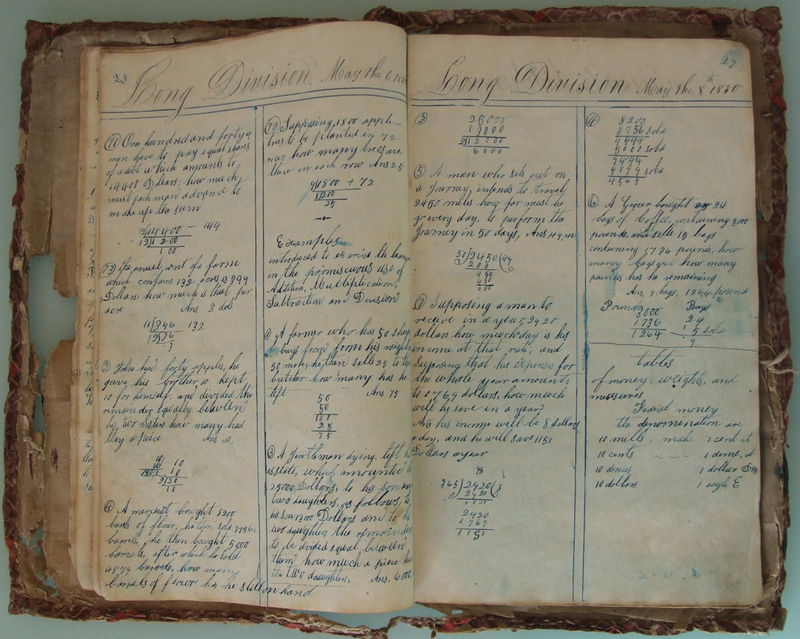 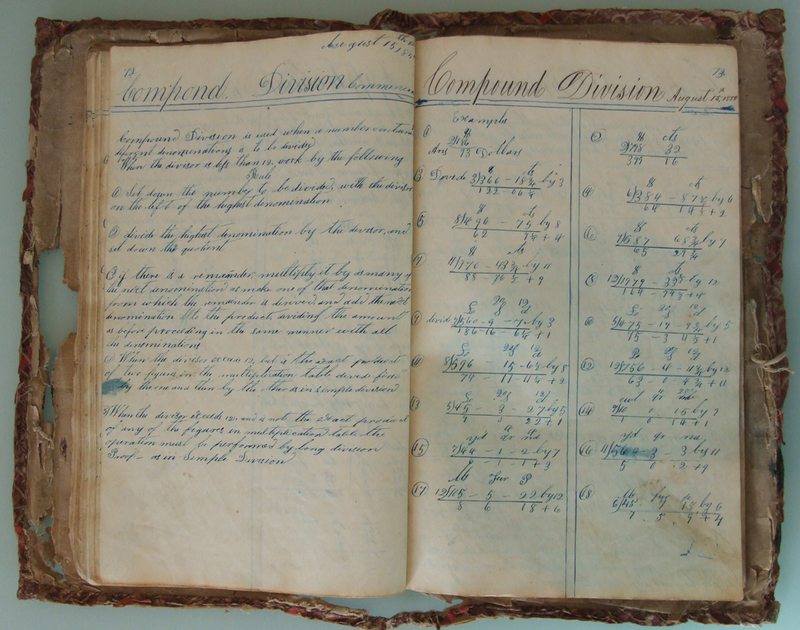 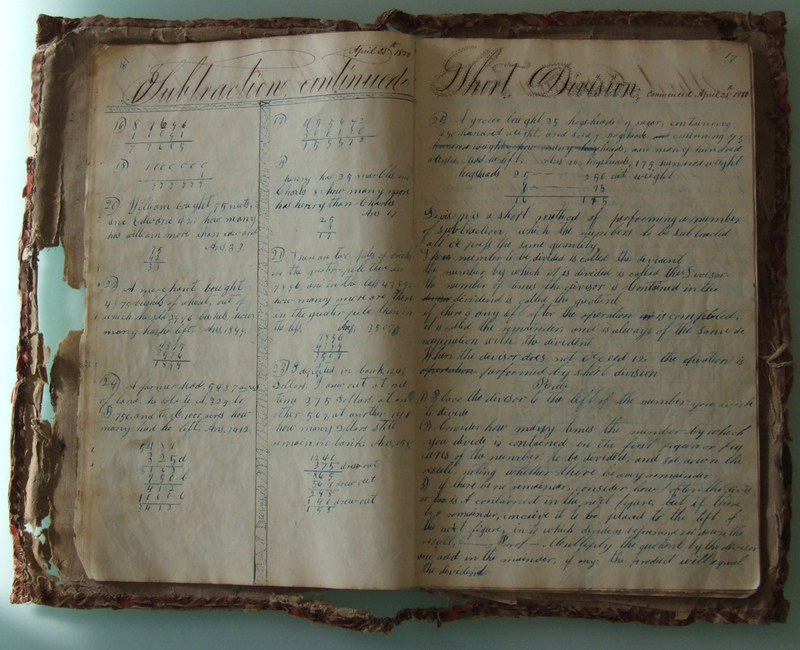 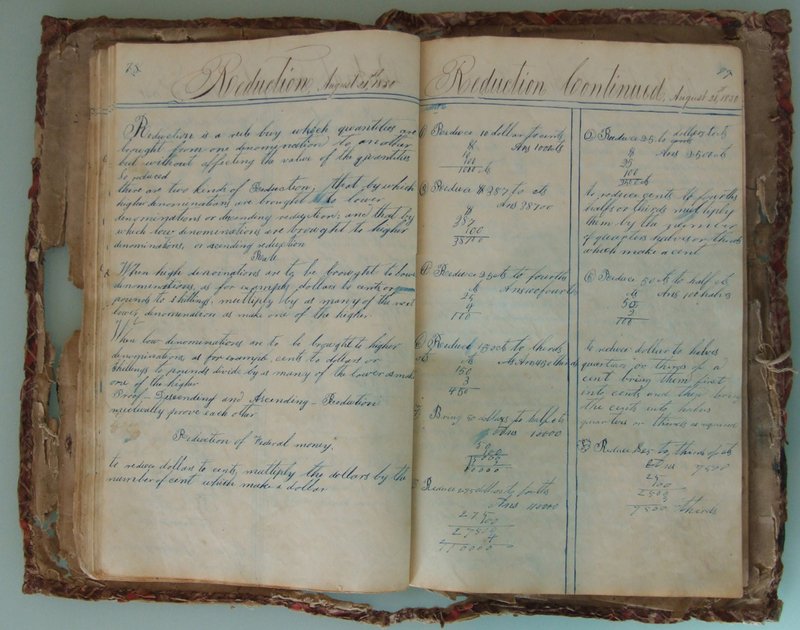 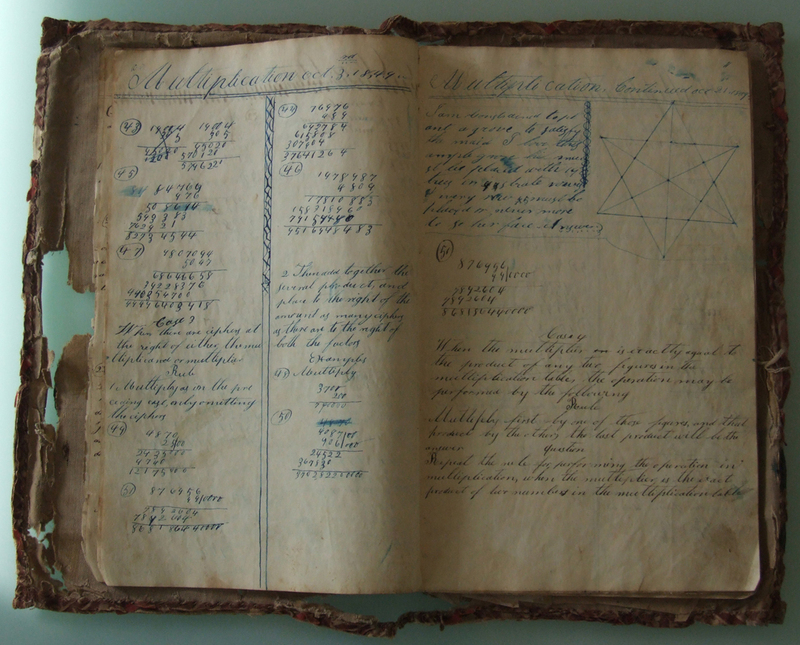 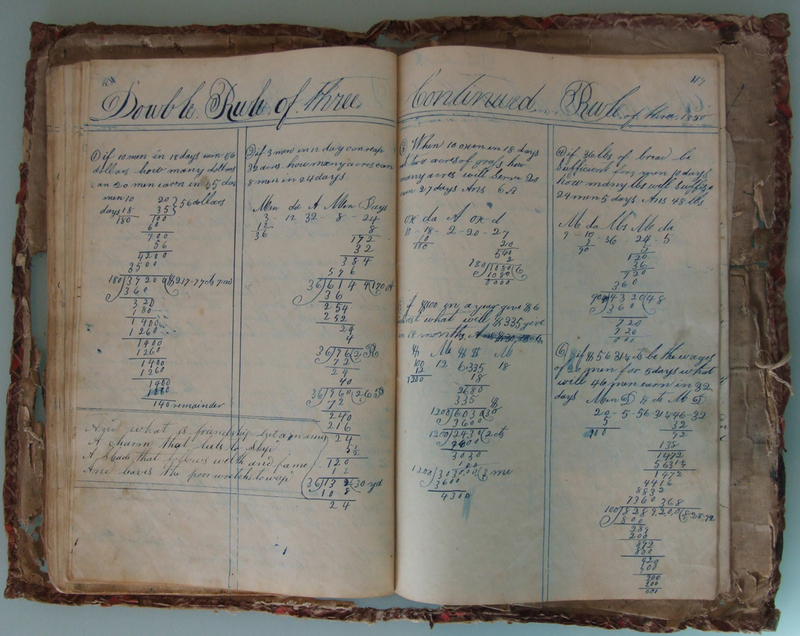 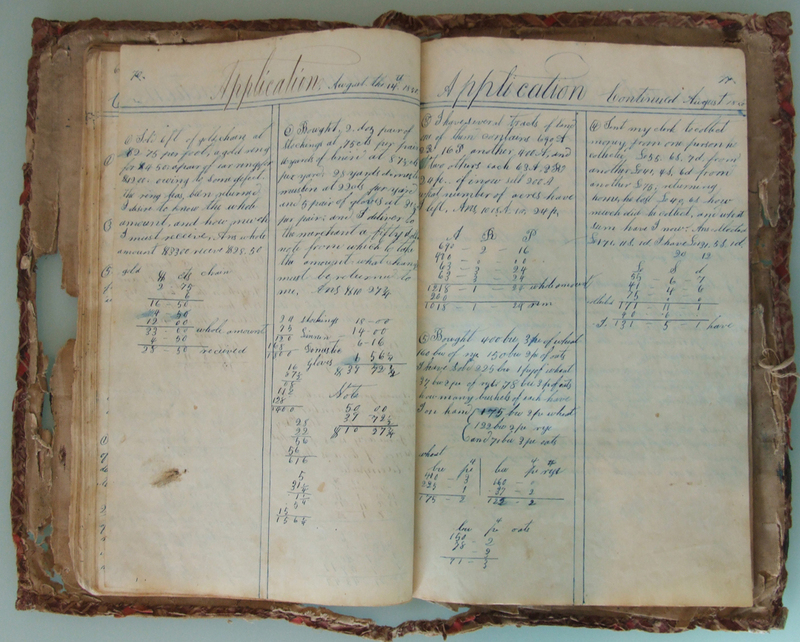 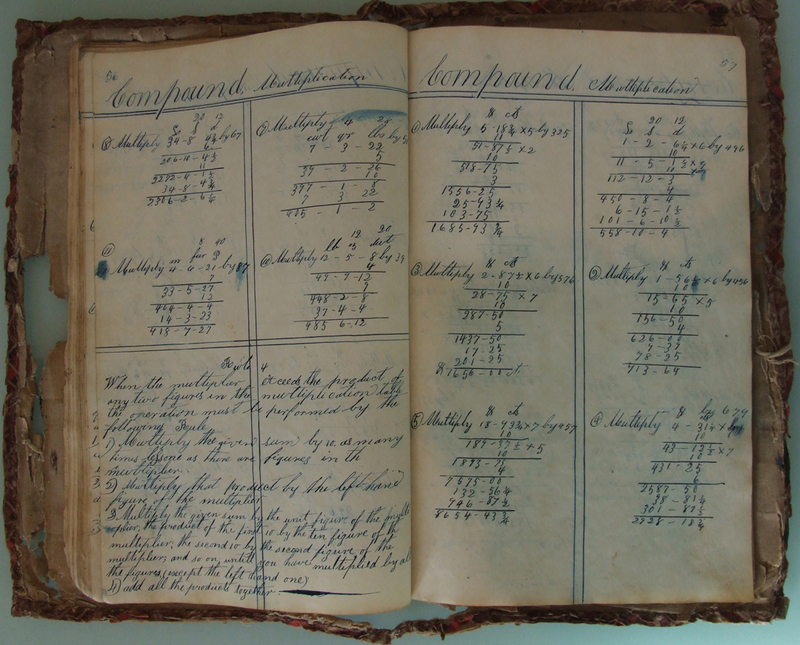 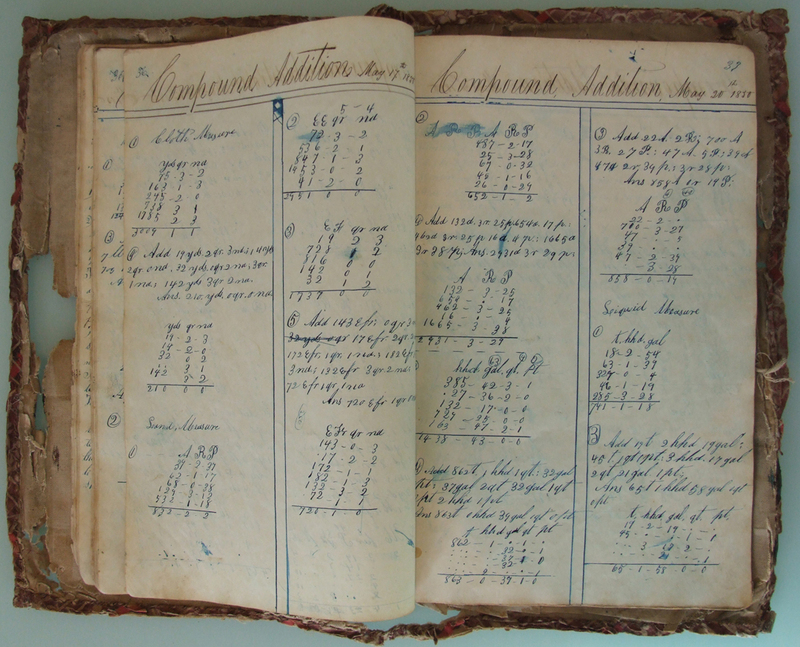 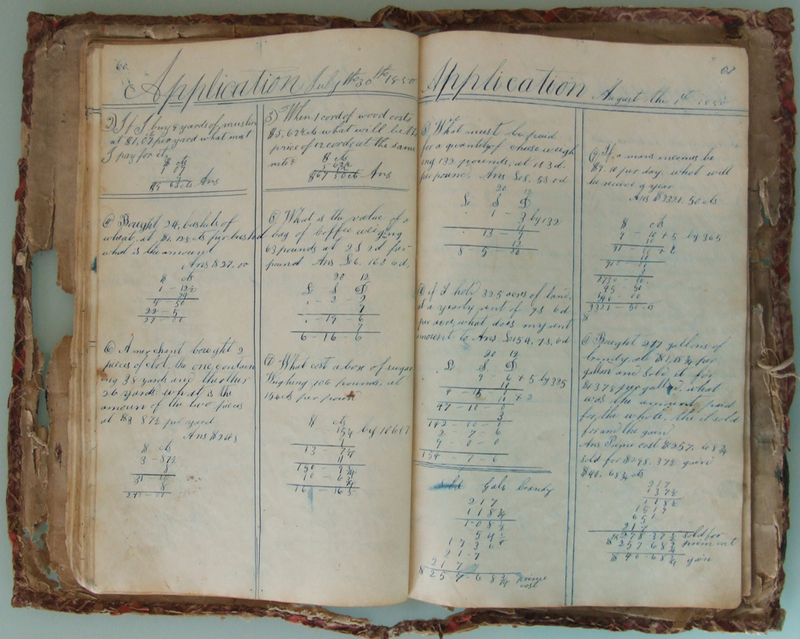 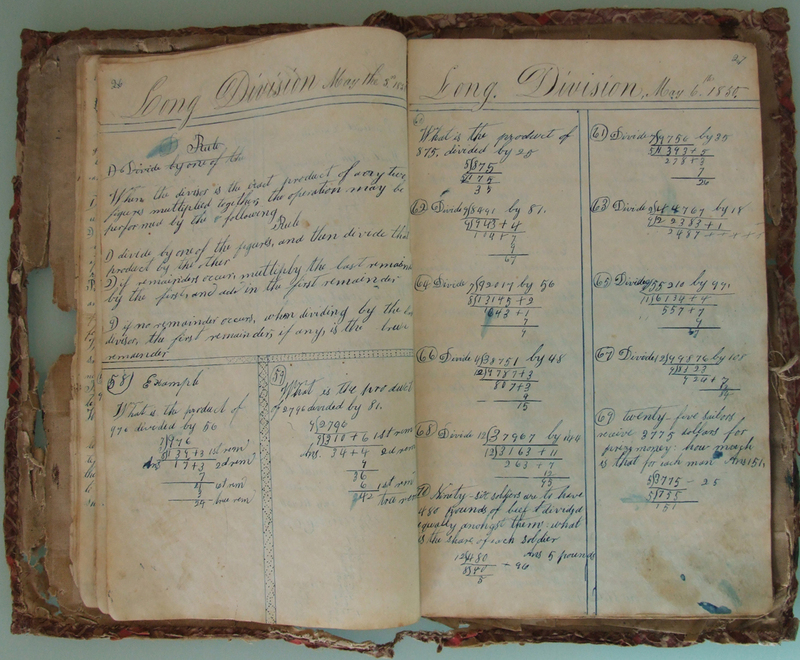 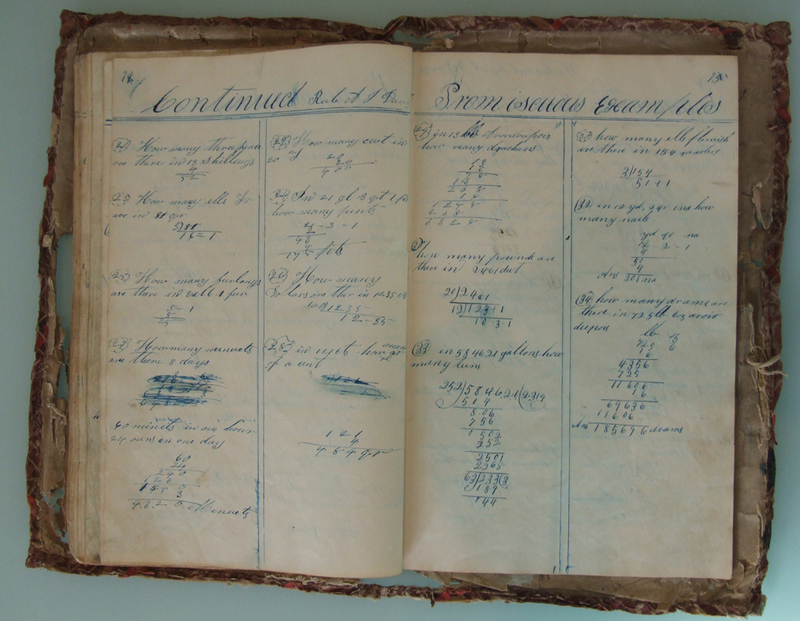 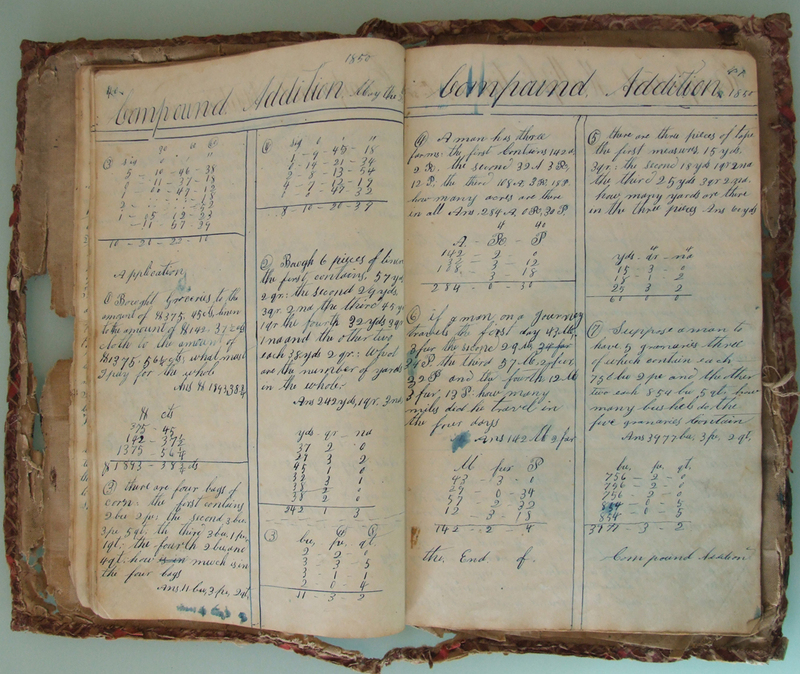 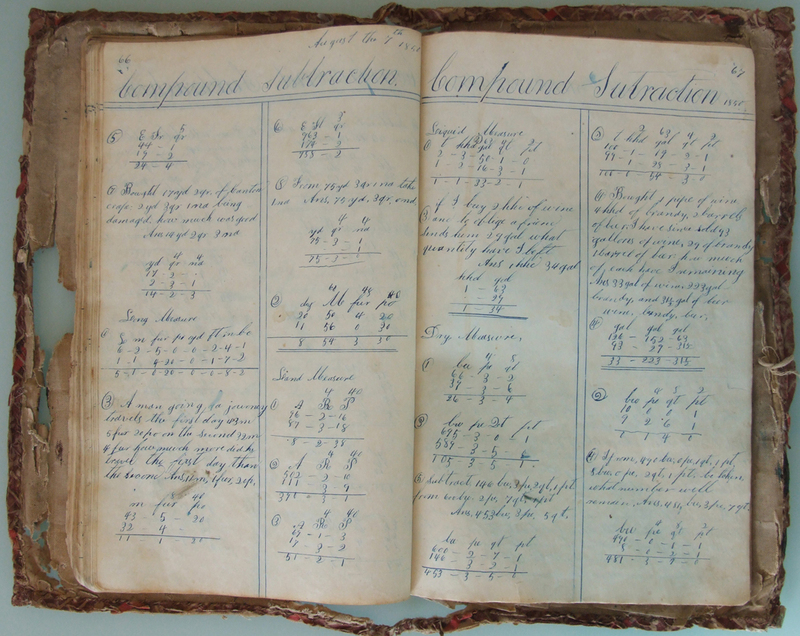 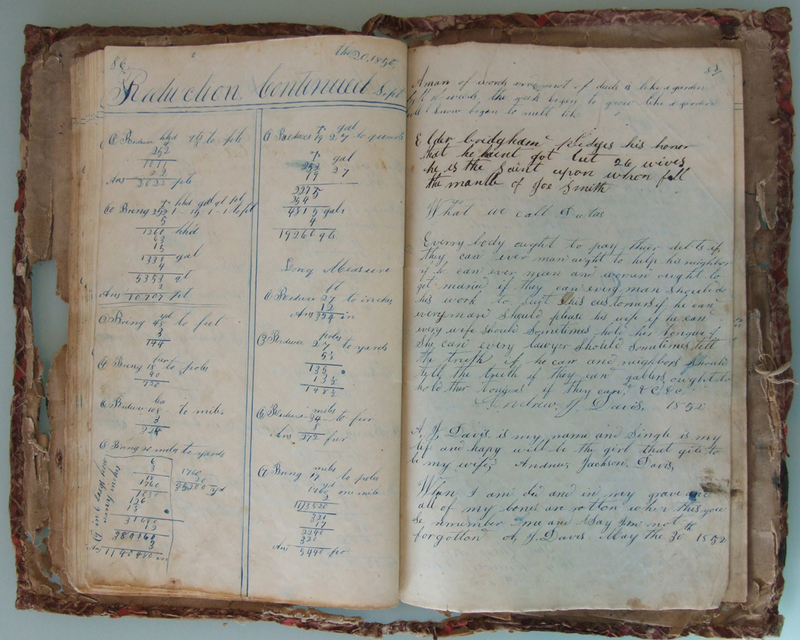 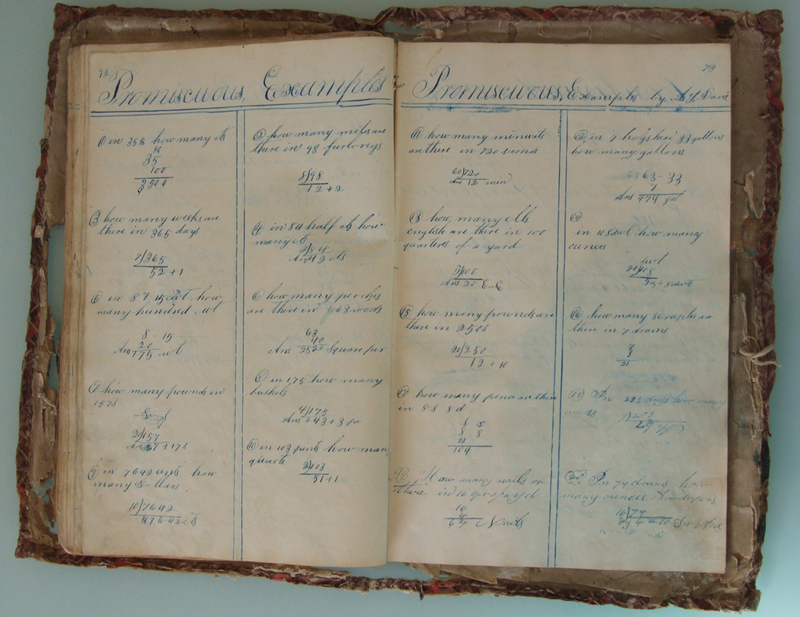 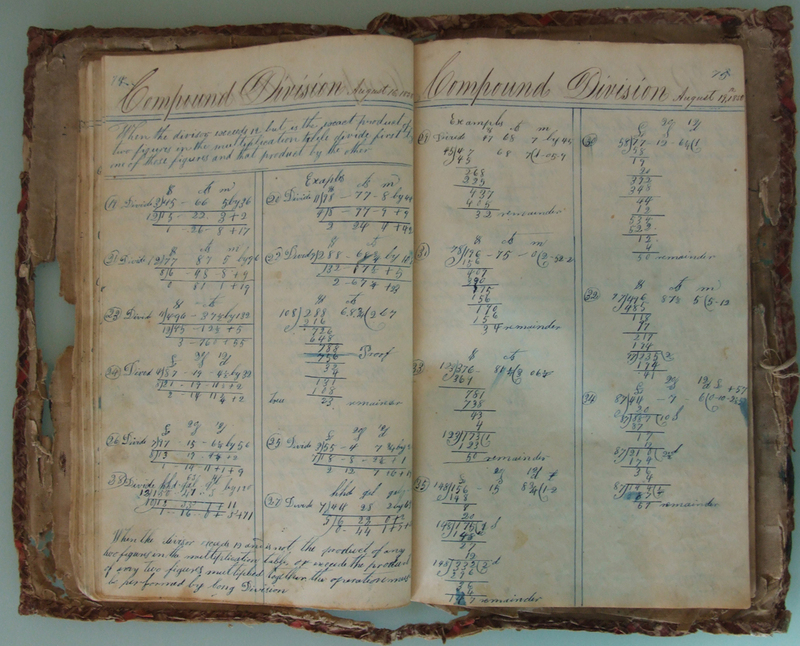 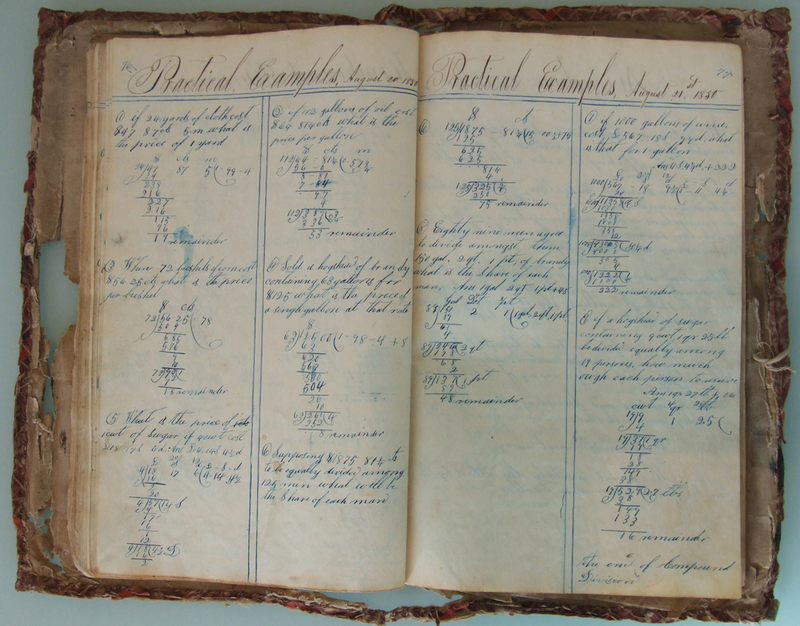 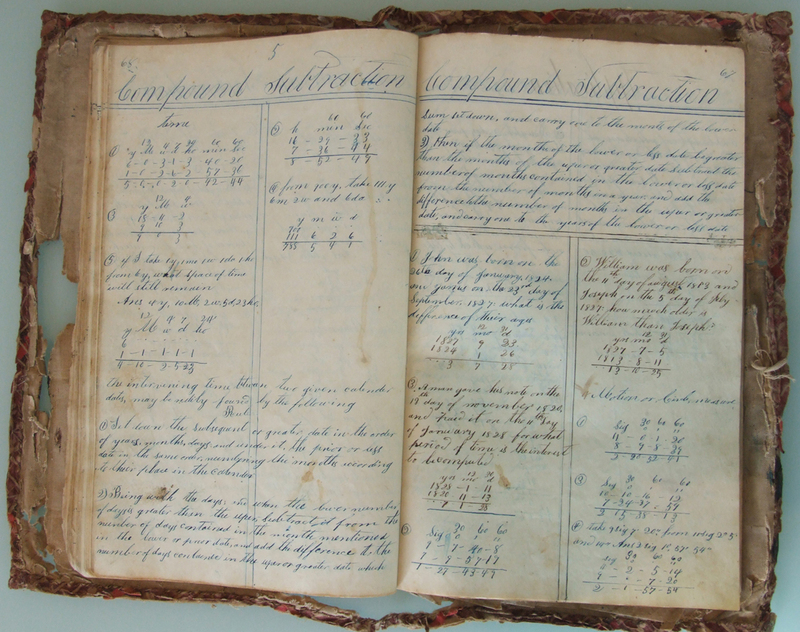 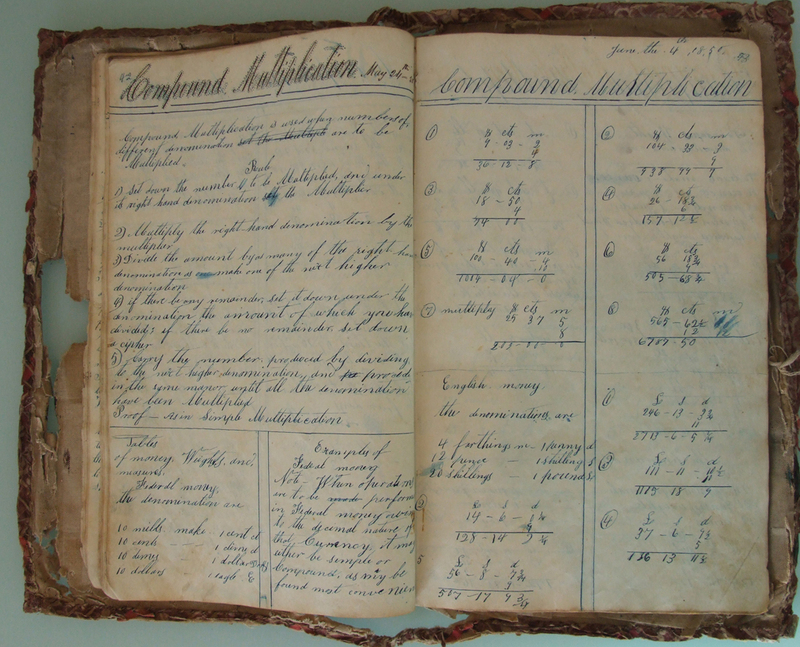 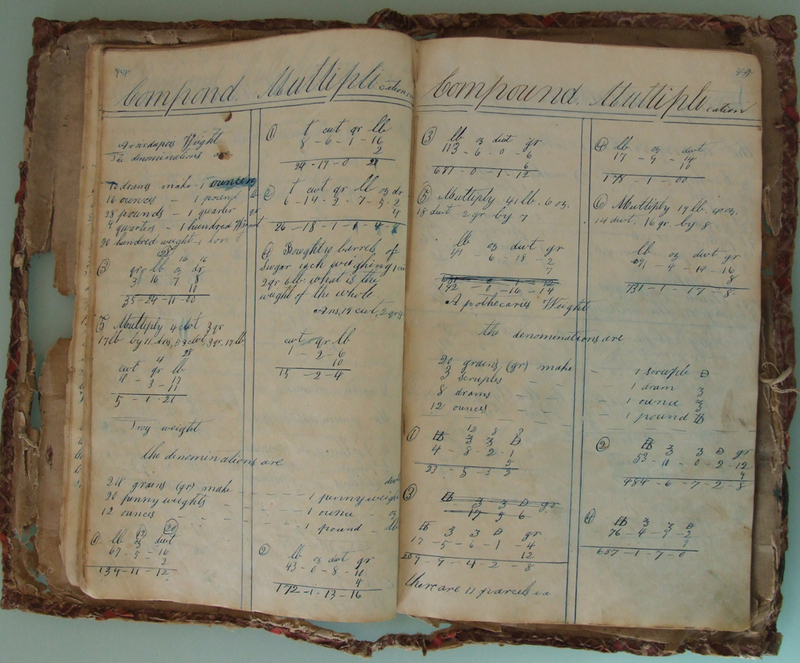 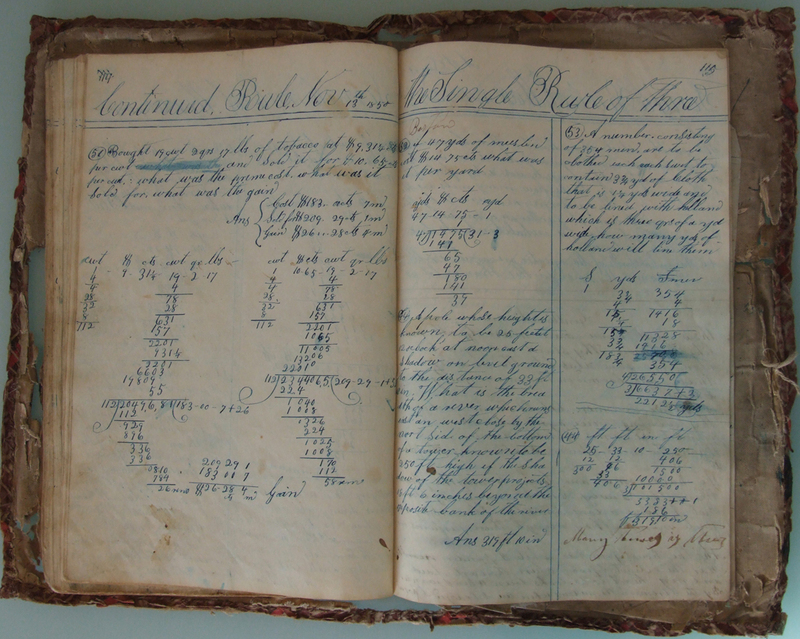 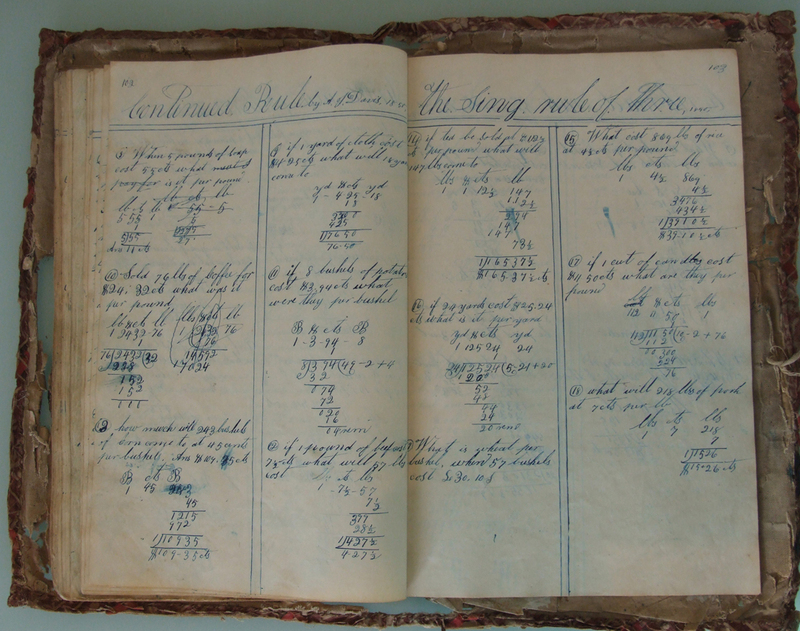 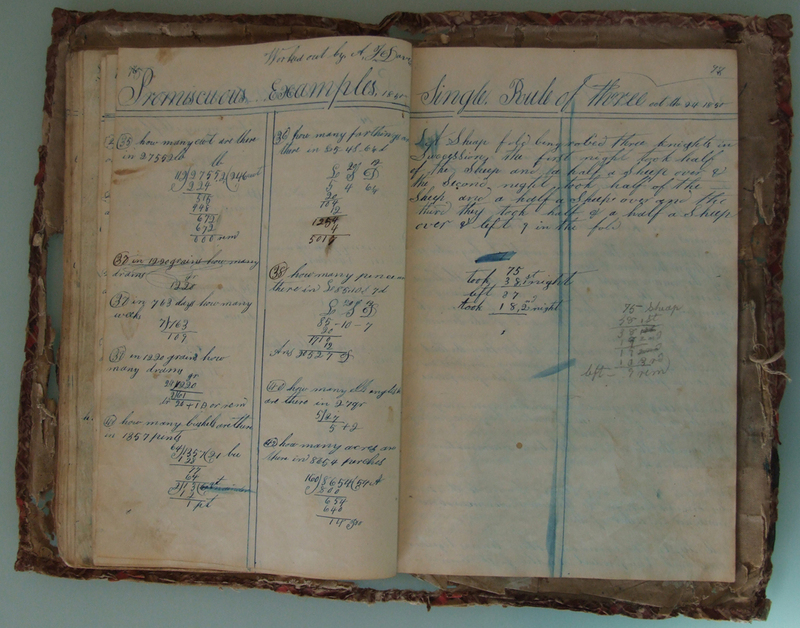 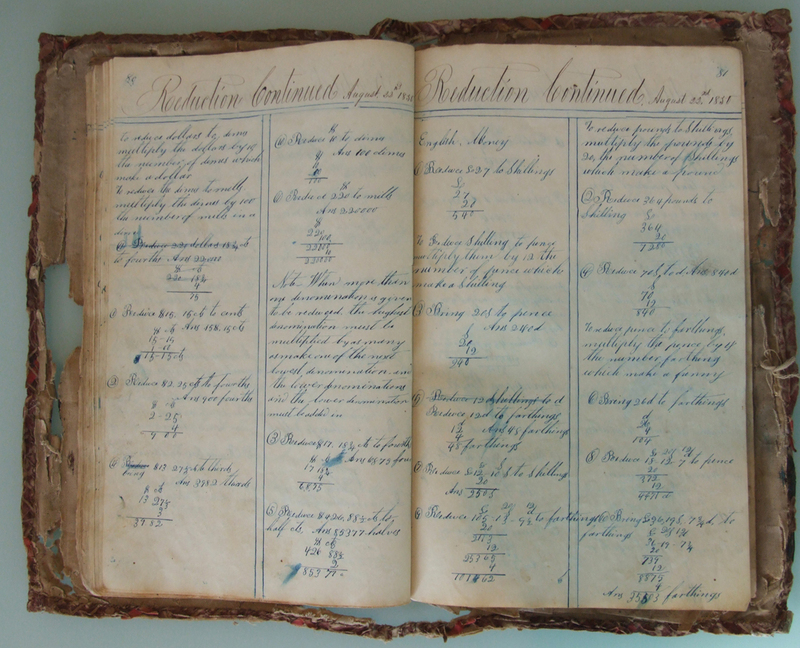 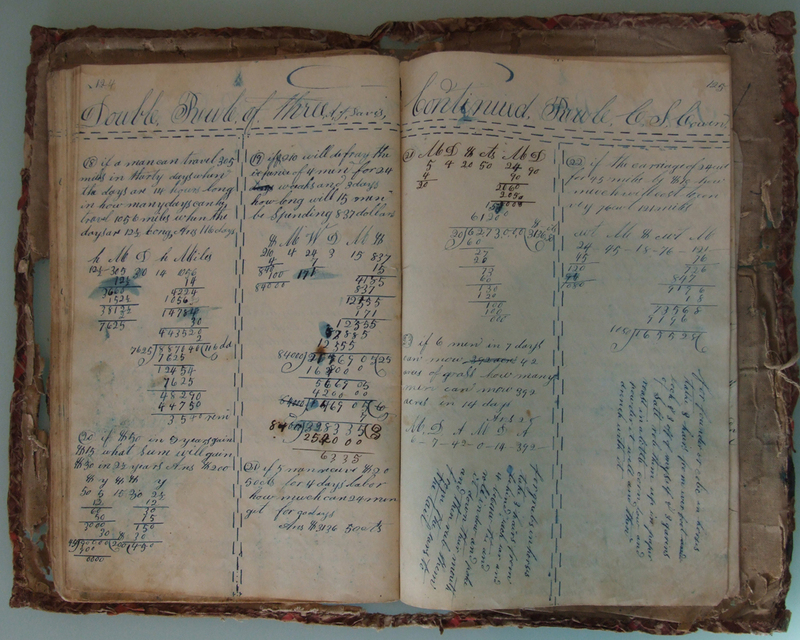 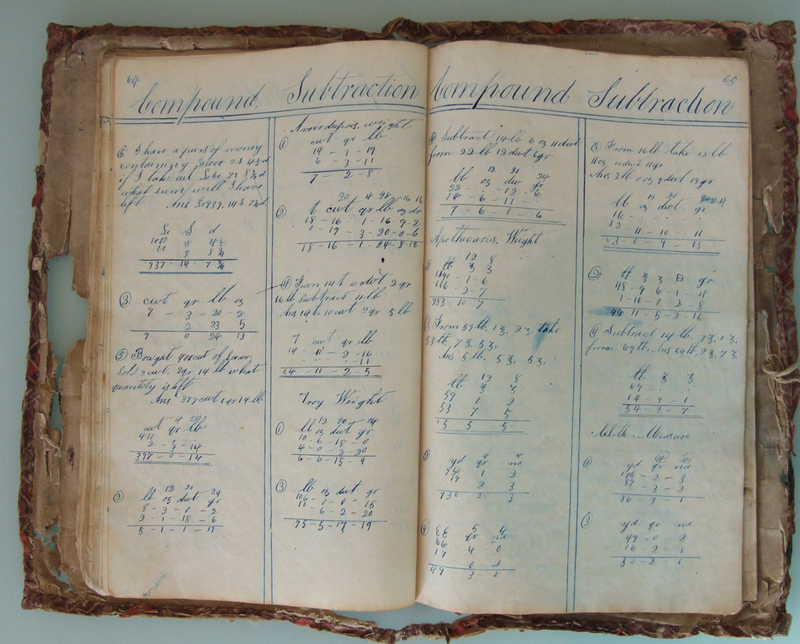 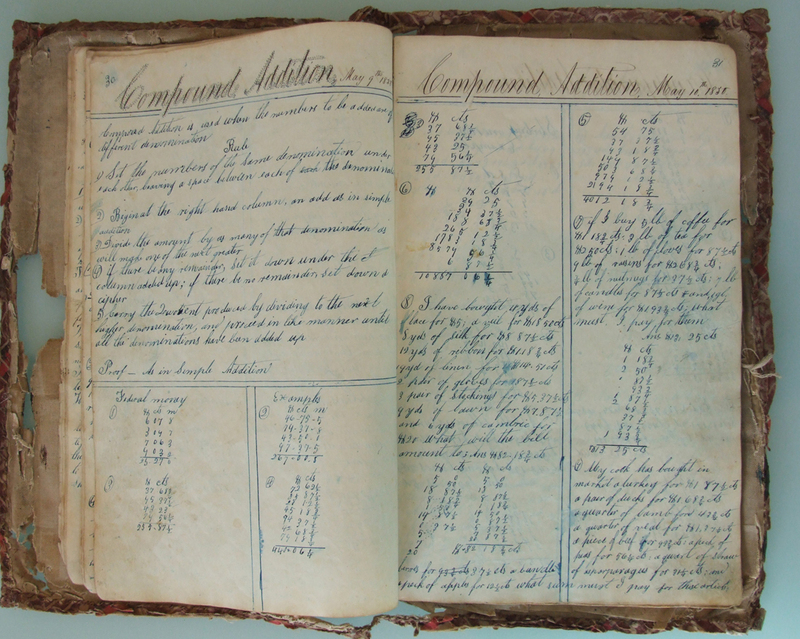 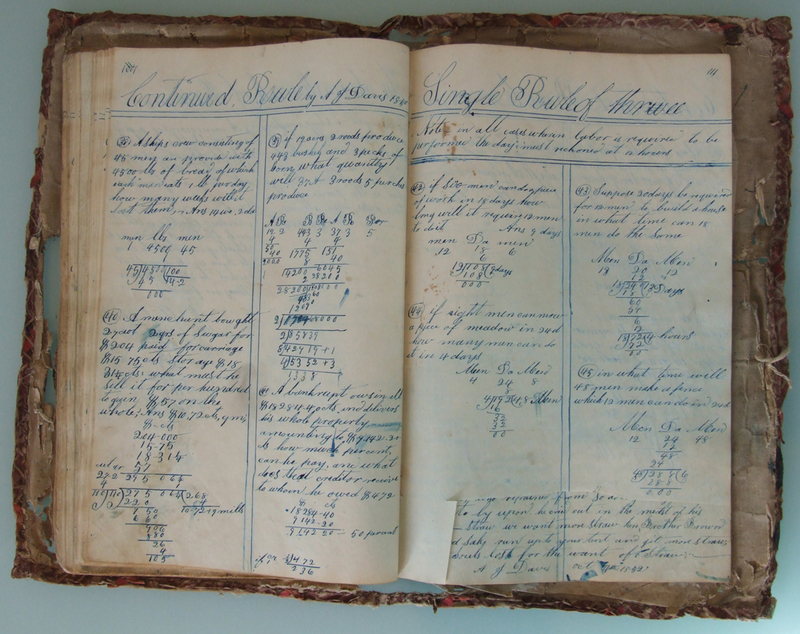 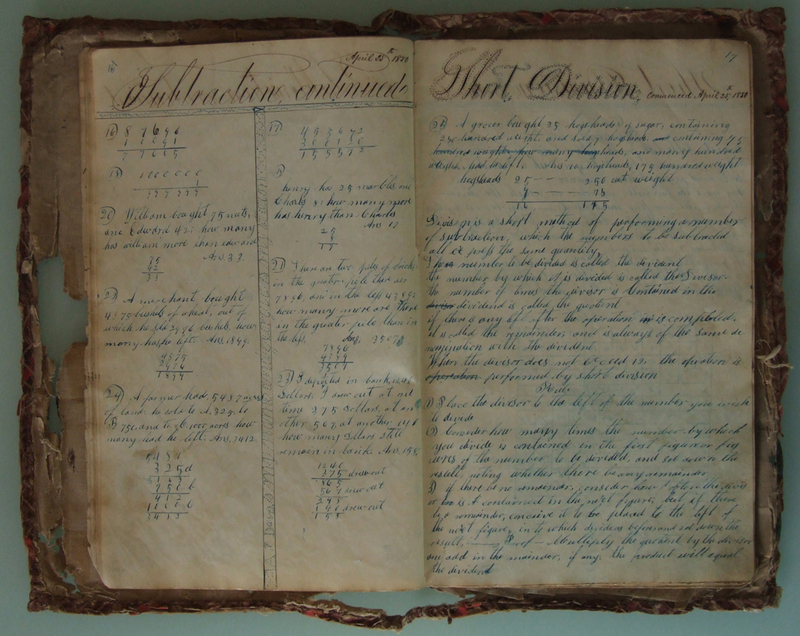 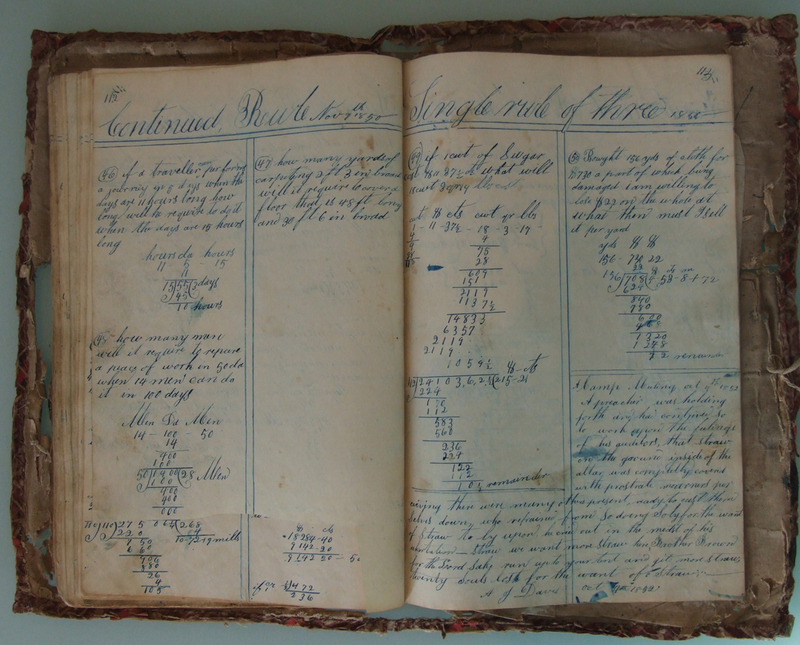 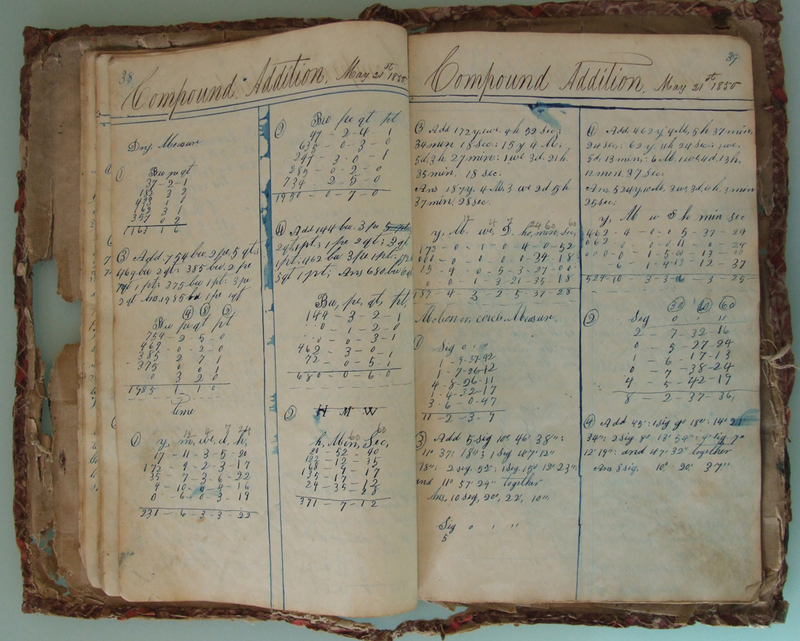 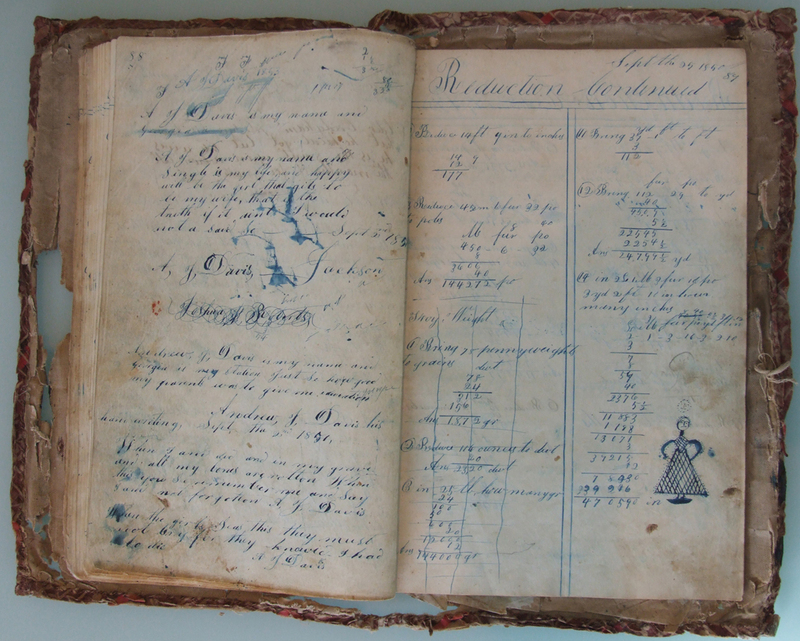 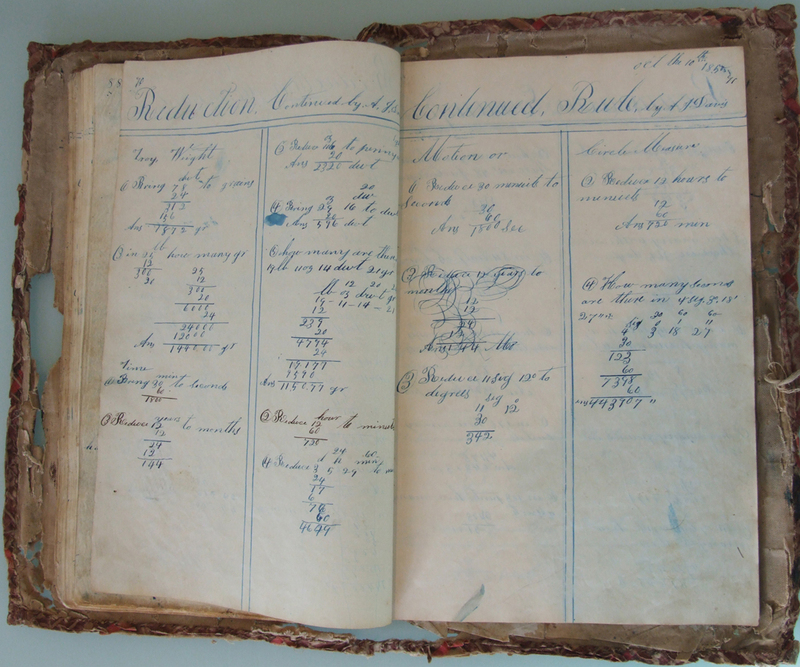 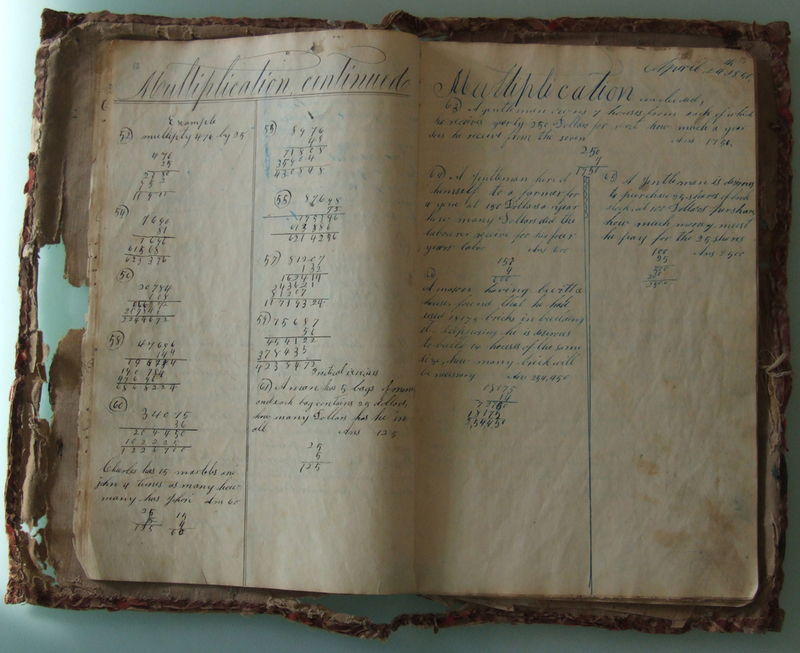 This copy book belonged to Andrew Jackson Davis (1829-1903), who used it for a variety of mathematical, penmanship, and other exercises, along with a few sketches, doodles, recipes, and poems. 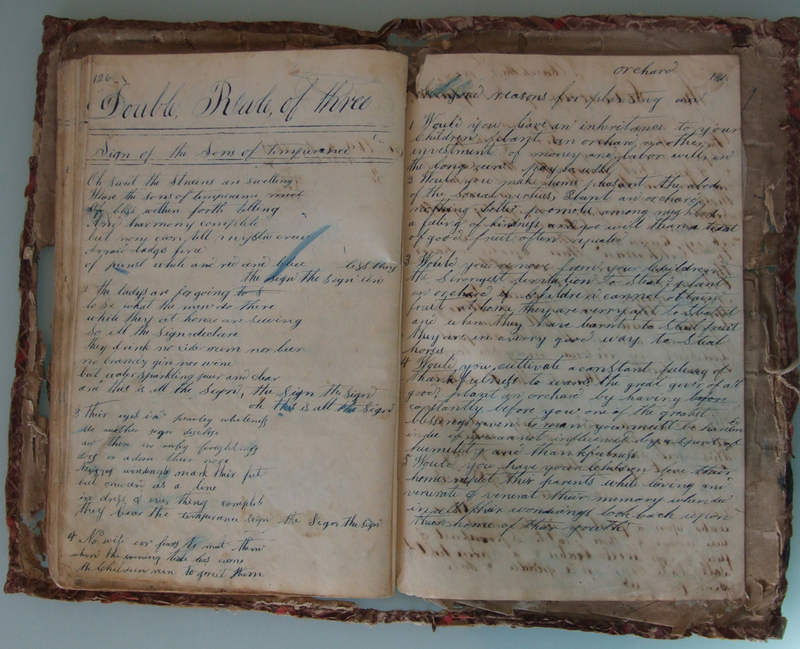 Written with pen and ink, the book's earliest date is 24 September 1847; the latest 1 March 1852. 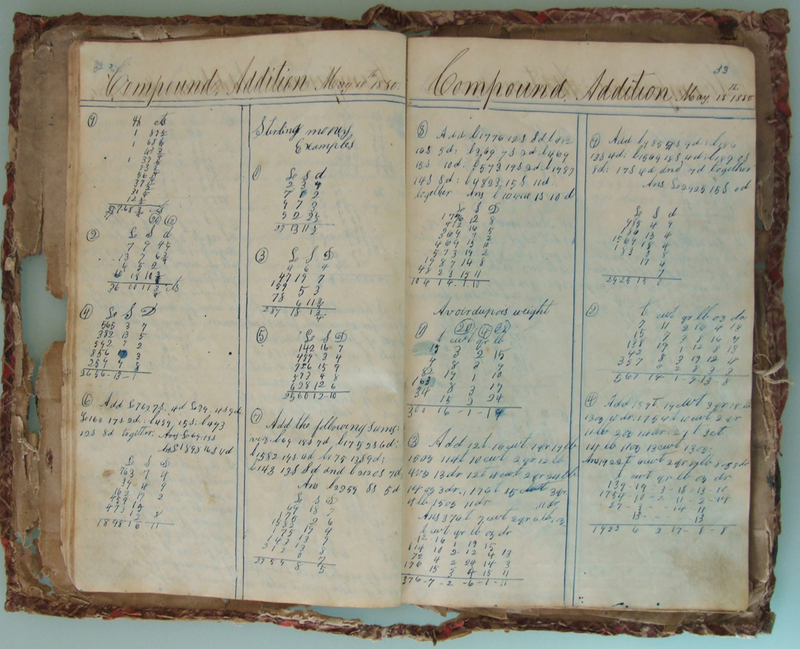 Davis was eighteen years old when he started the copy book, but it isn't clear where he was studying, although it was almost certainly in Fayette County. 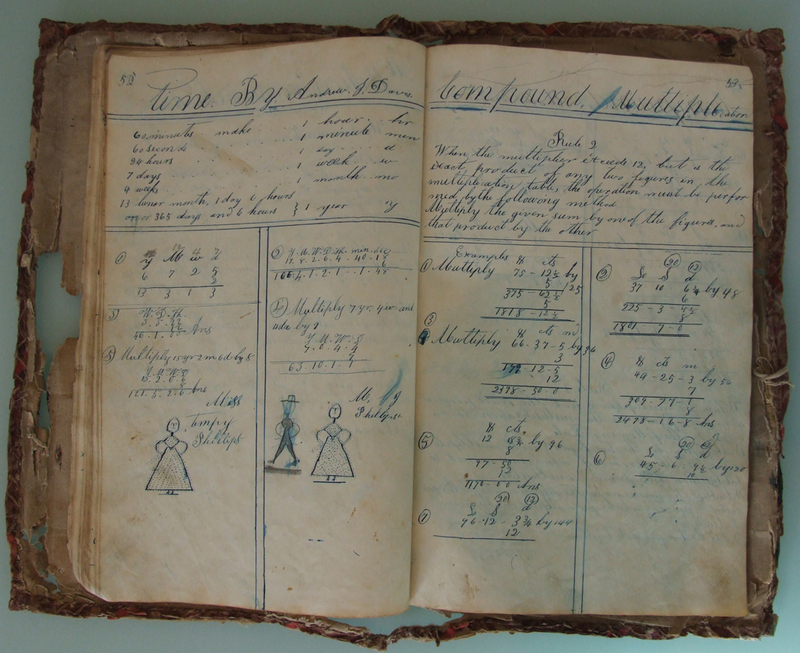 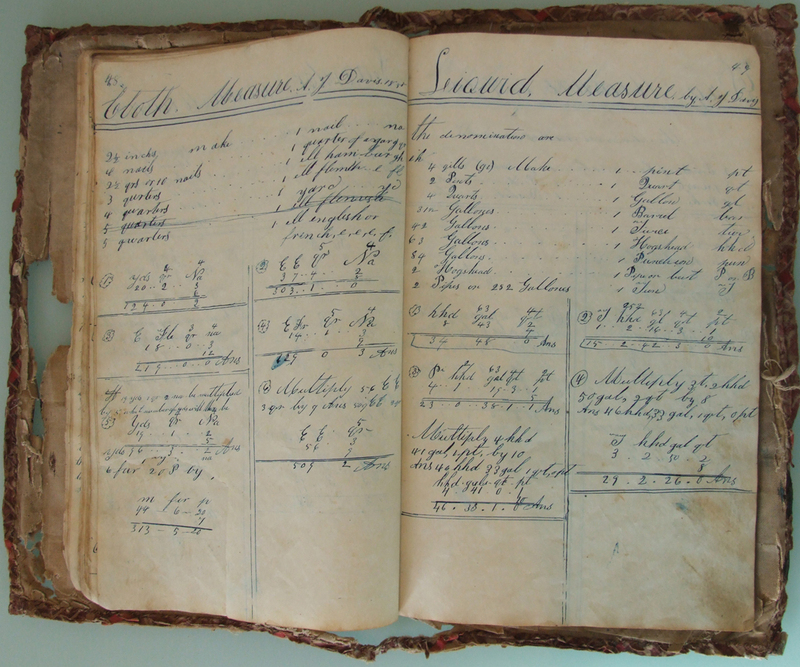 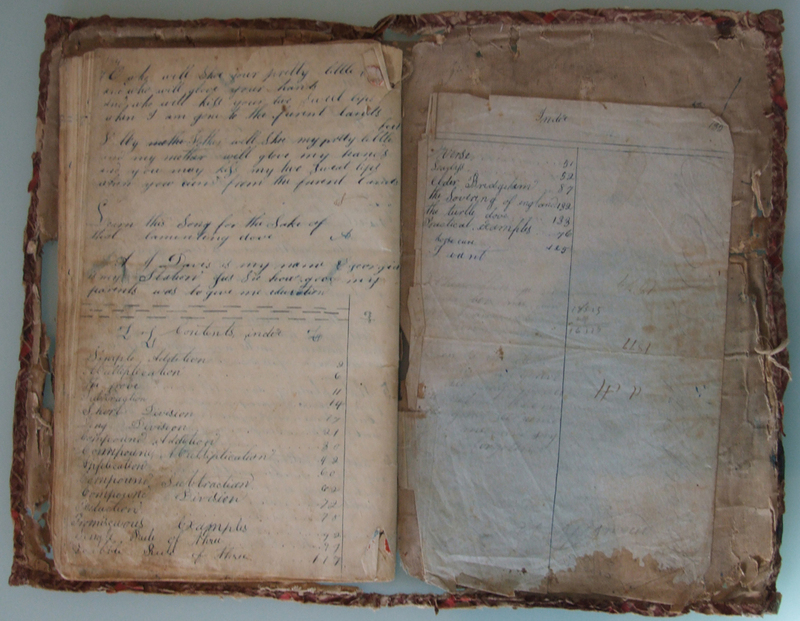 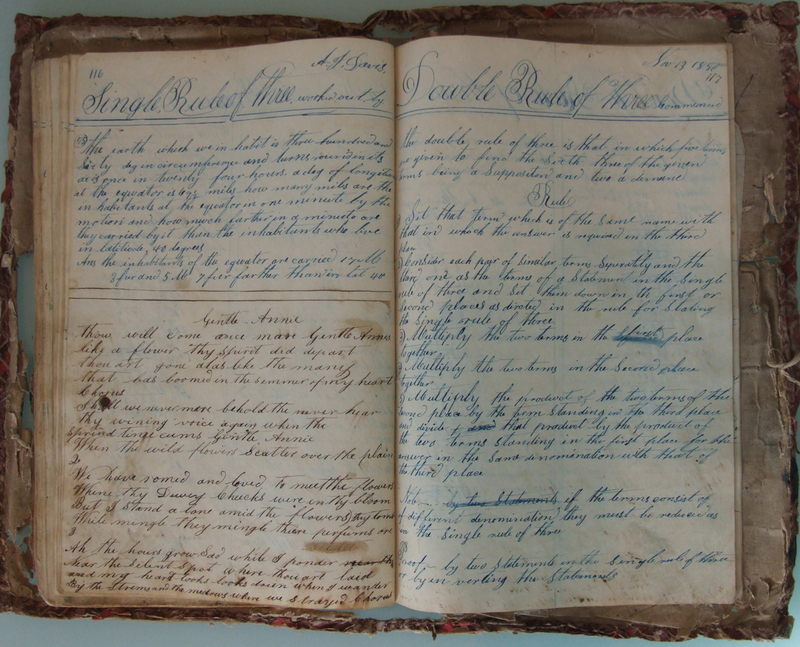 After his brother's marriage in October 1847, responsibility for their aging parents naturally fell on his shoulders, and he continued to live alone with them until his marriage in August 1852, a few months after the last entry in his copy book. 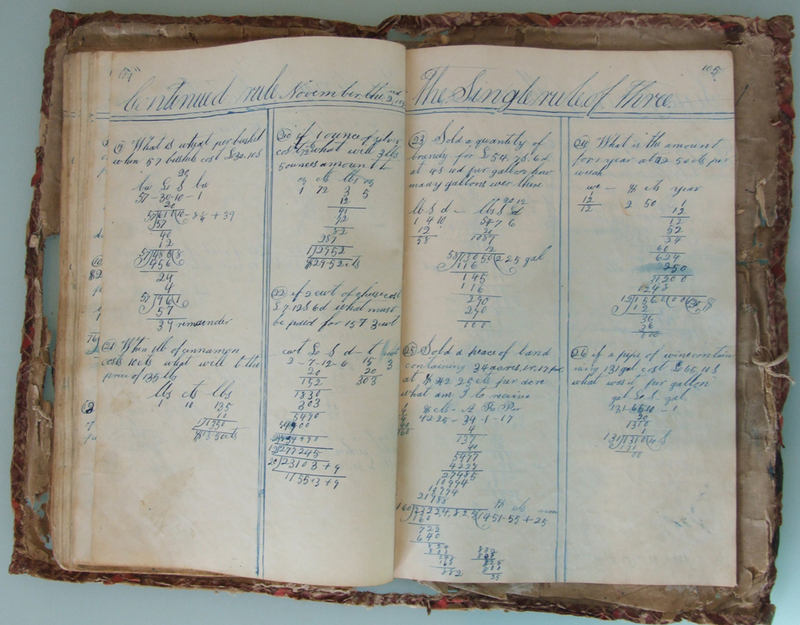 His course of study appears to have focused on more complex mathematics than would be typical for most of his more poorly educated neighbors. 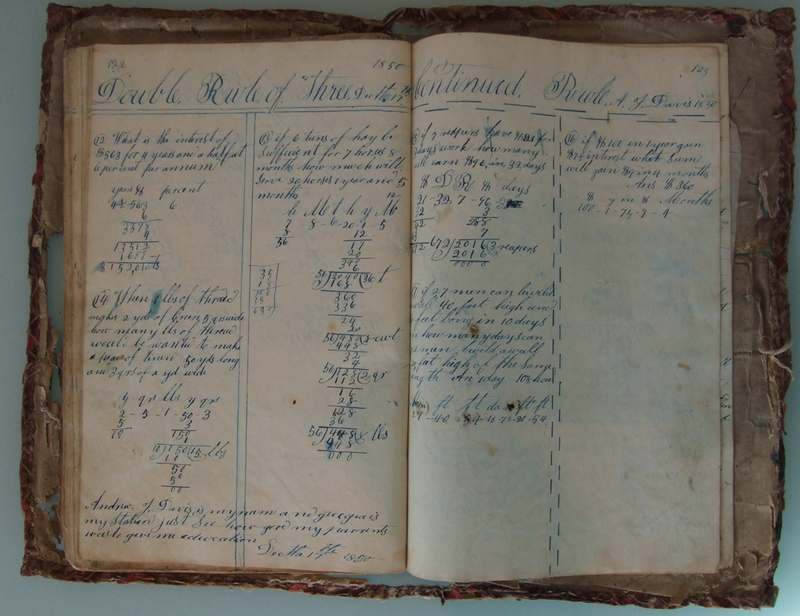 As a stone mason and carpenter, a good working knowledge of math would be indispensable. 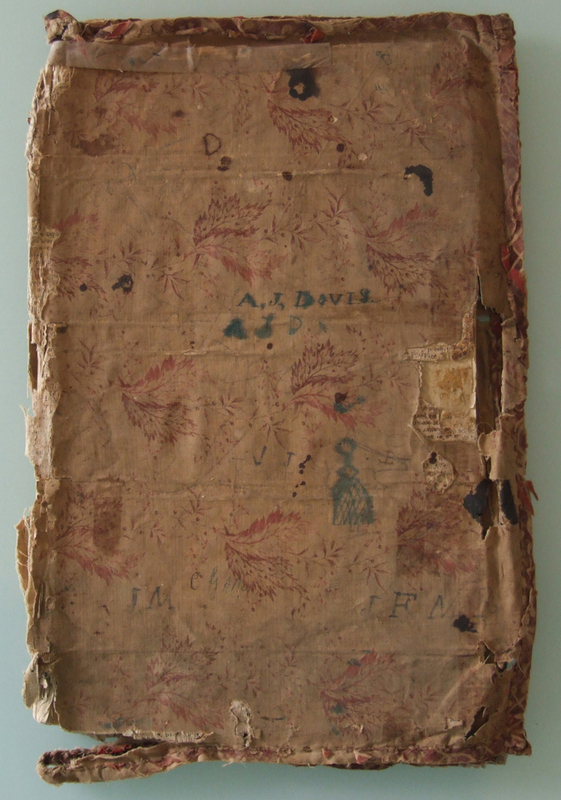 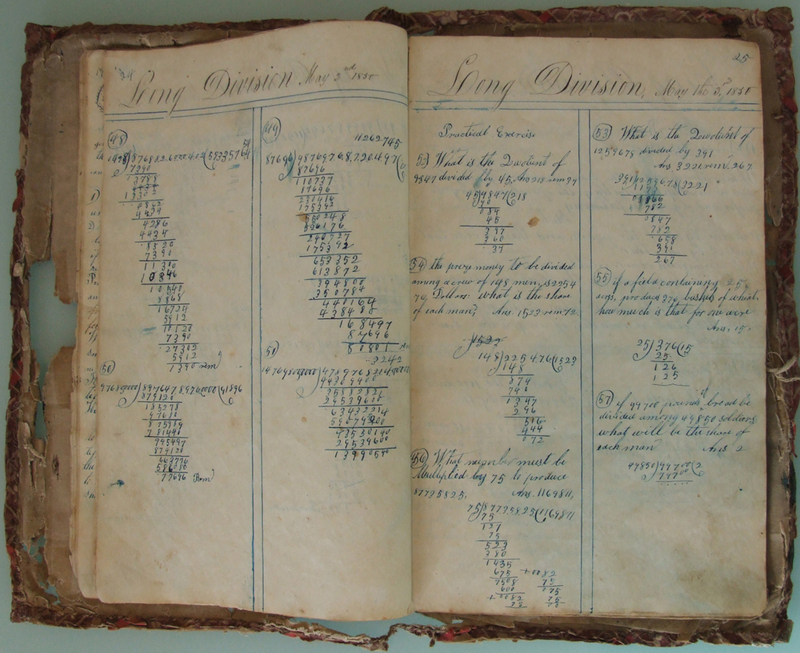 The book itself was probably made by his mother or one of his sisters, although it could have been by Davis himself. 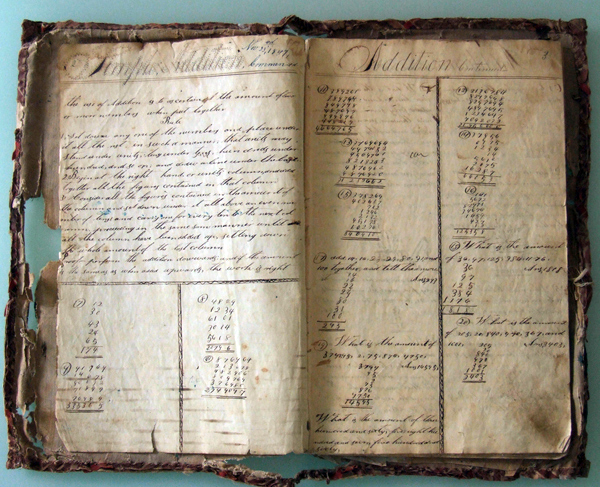 The cover, which is continuous front to back and folded vertically, measures around 18" wide by 14" high. 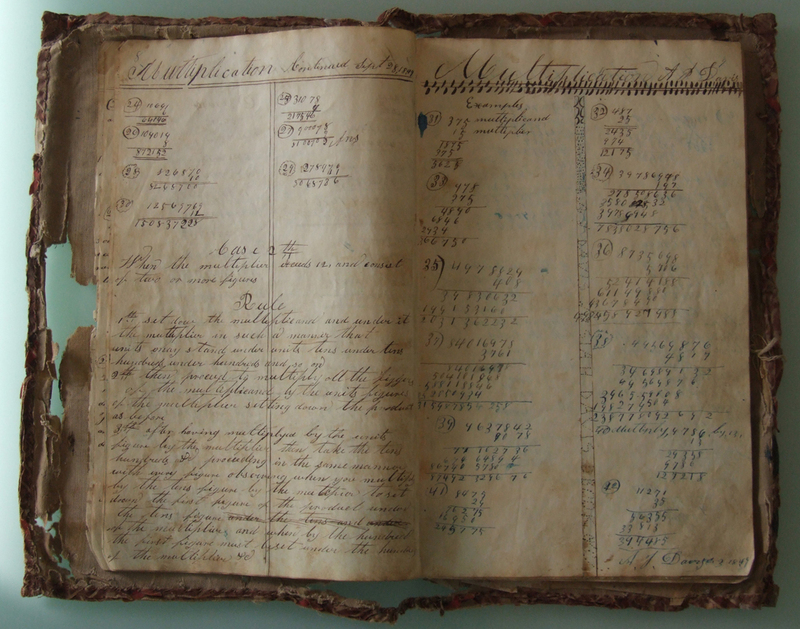 It consists of a layer of osnaburg, which is a type of coarse linen, a layer of newsprint, and an outside layer of a printed chintz fabric, with all three layers glued together and then finished by a band of another printed fabric, around 1½" wide, wrapped and hand-sewn to finish the edges. 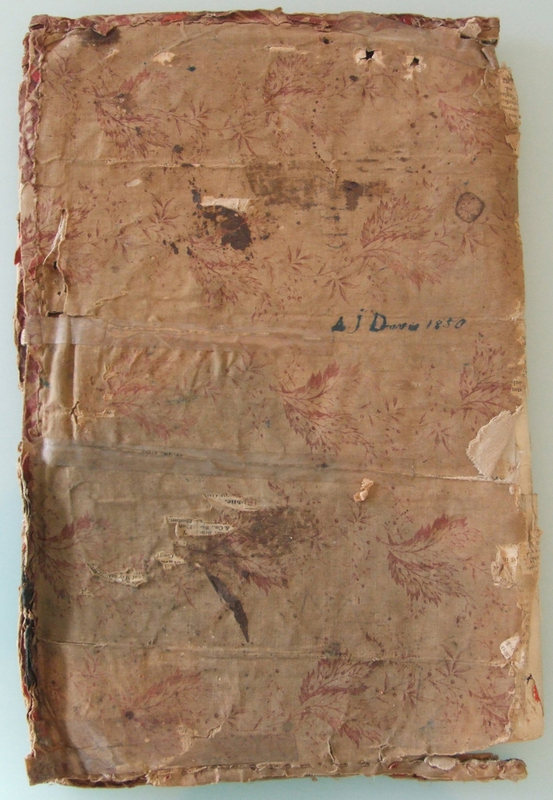 The chintz cover, which is badly worn, may have originally been white and was printed in a repeating design of pairs of leaves that appear to have originally been red and pink, connected by single garlands of an unidentified vine, also in red. 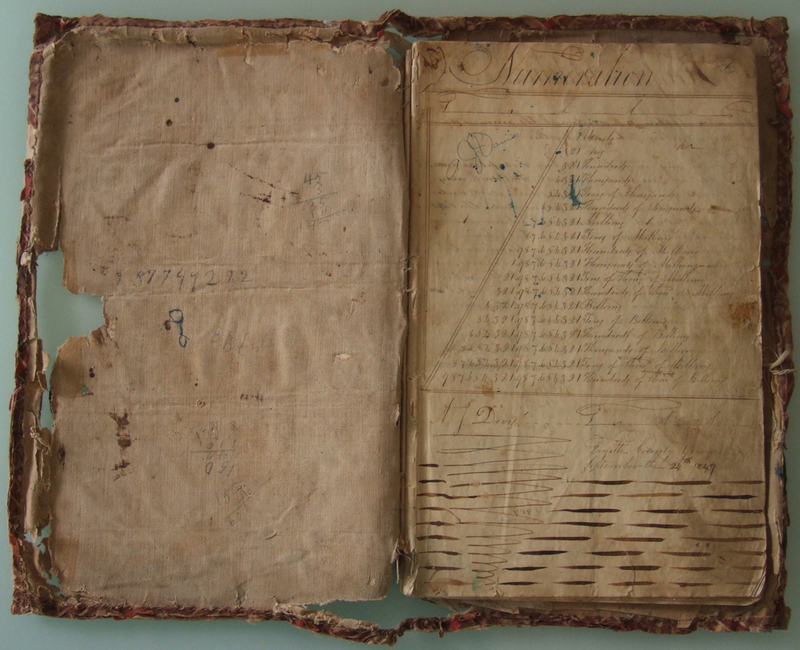 Sewn into this cover are a twenty-two-leaf folio and a twelve-leaf folio, each leaf 15⅝" wide and 12¾" high and folded vertically. 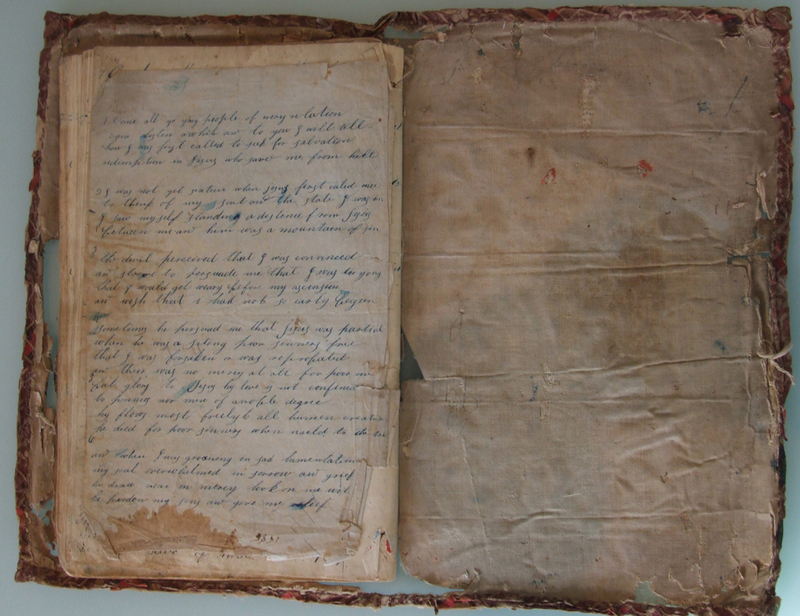 The finished book is around 9" wide by 14" high. 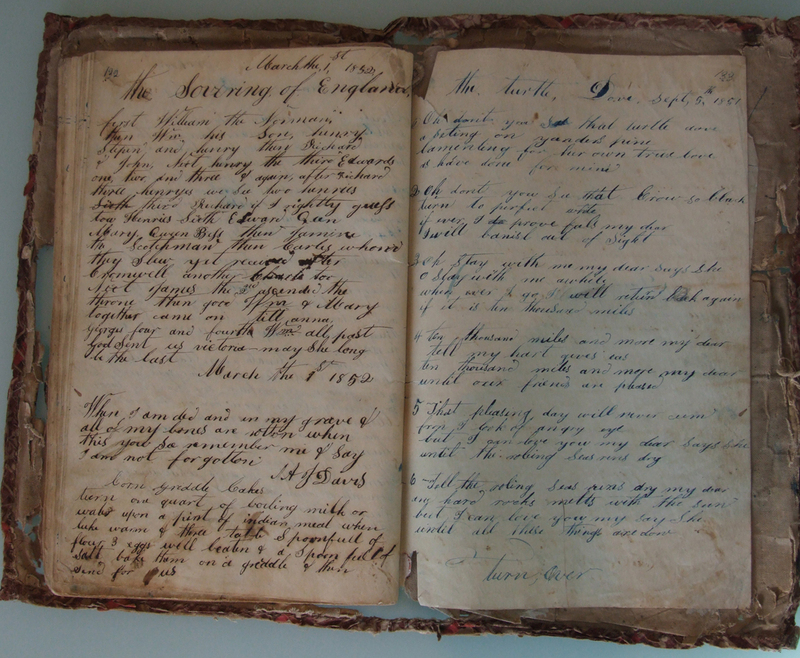 The book was preserved after Davis' death by his daughter Ofie Aurelia Davis Jones (1869-1953) and passed on to his granddaughter Dorothy Jones Venable (1914-1994) and his great-granddaughter Carol Venable (1946-2010), who conveyed it to me after her mother's death. Below are links to photographs of the individual pages.